Another trip report so skip if you are not interested! We had booked a eight night cruise aboard the Windstar, a small, four masted ship. The sails are computer operated. It holds 148 passengers and can visit places the bigger cruise ships cannot get to. 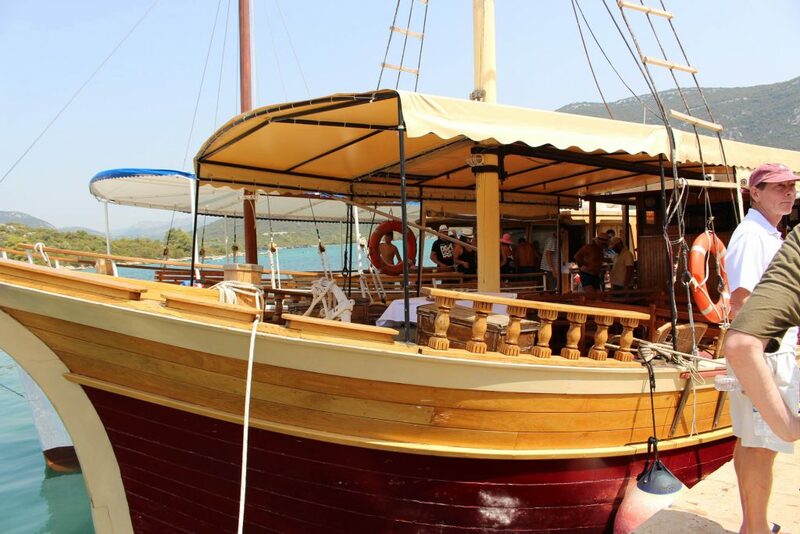 It is also billed as a luxury cruise with a ratio of one crew to each two passengers. We’ll see what it’s like. It is our first cruise. Arrived Venezia on the 2:20 Frecciarossa train. Hottern’ blue blazes. Got the number 2 vaporetto packed with tourists. 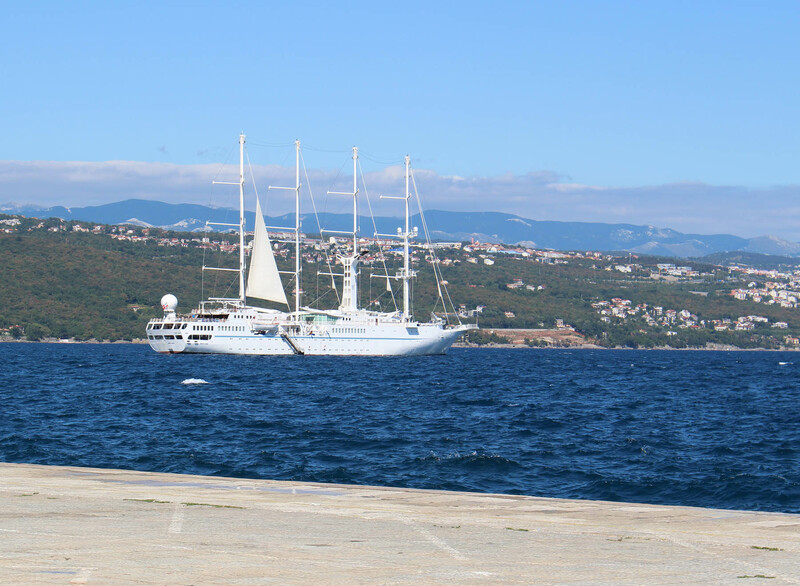 Made it to the San Basilio dock where the Windstar was moored. But wringing wet with perspiration. The security process was a little like an airport. They did have cold lemon water, iced tea and cookies which maybe TSA could look into. We went through the metal detector and then walked to the ship and up the stairs and were met with a big tray full of cold damp towels. Heaven. We were checked in and went to our cabin. I had opted for a room on the bow on the port side. It is a spacious room with plenty of room to put our clothes etc. We went out exploring to get the lay of the ship. There was a mandatory safety session where we all met up with our muster groups and learned how to use the life jackets and were instructed how to evacuate the ship. 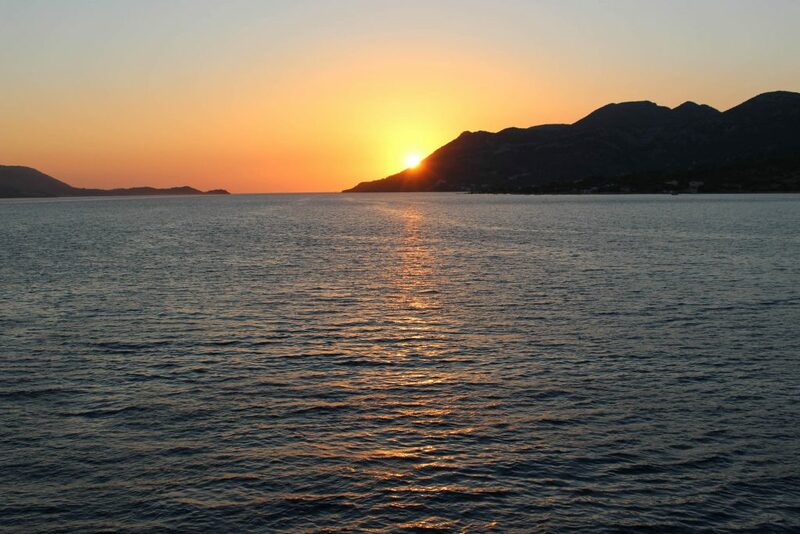 The ship has two decks of staterooms, decks 1 and 2. 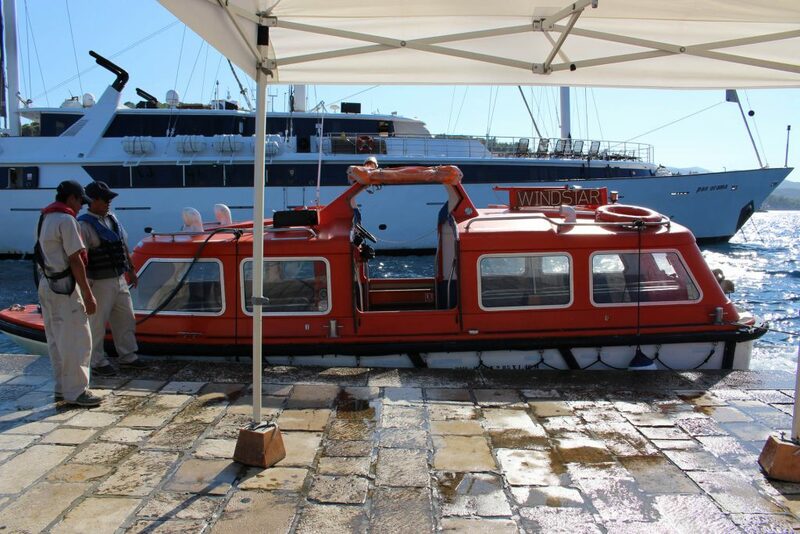 Deck three is the main reception area with doors to go onto the tender, a small boat that takes us to and from the towns when we can’t dock. There is also a lounge where there is music in the evenings and announcements about shore excursions in the daytime, and the main restaurant called Amphora. Also on this level is a library, computer room, small casino, spa, and shop. The next deck up is deck four with the bar, small swimming pool…really small. And then there are all the deck chairs and some tables and umbrellas. The other part of this deck is the Veranda where you eat breakfast and lunch. And the front is the bridge. Above the pool is one more place to sit with great views of everything. 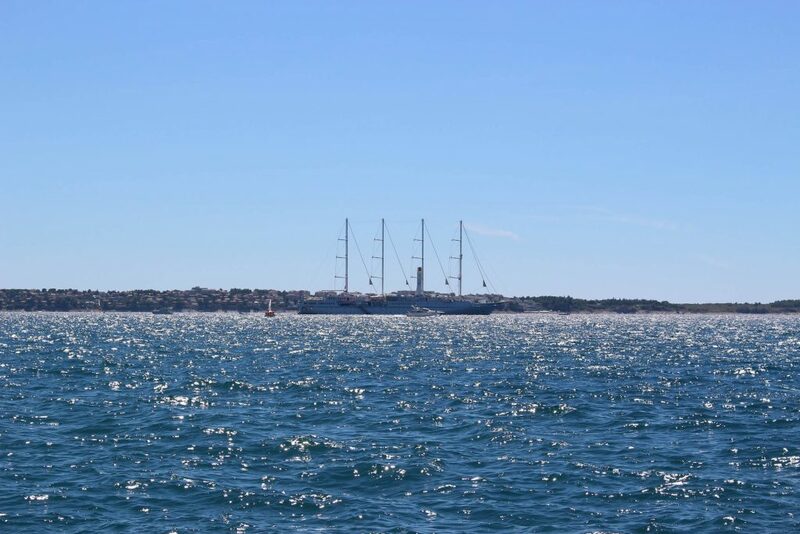 The four tall masts march back from there. 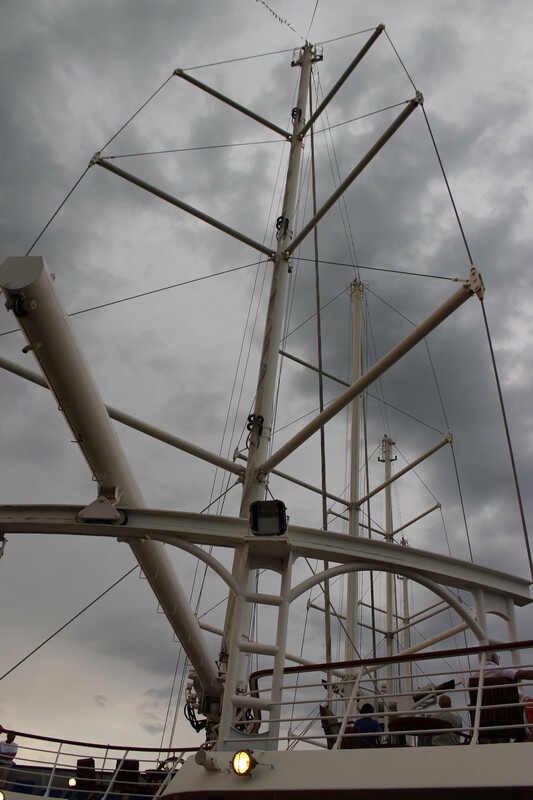 After a shower we went up on deck to watch the “signature Windstar sailaway”. Each day when you leave the port they play beautiful stirring music. I found out it is 1492 Conquest of Paradise by Vangelis, click to listen on YouTube. Big thunderstorms were threatening. It was too windy to use the sails. 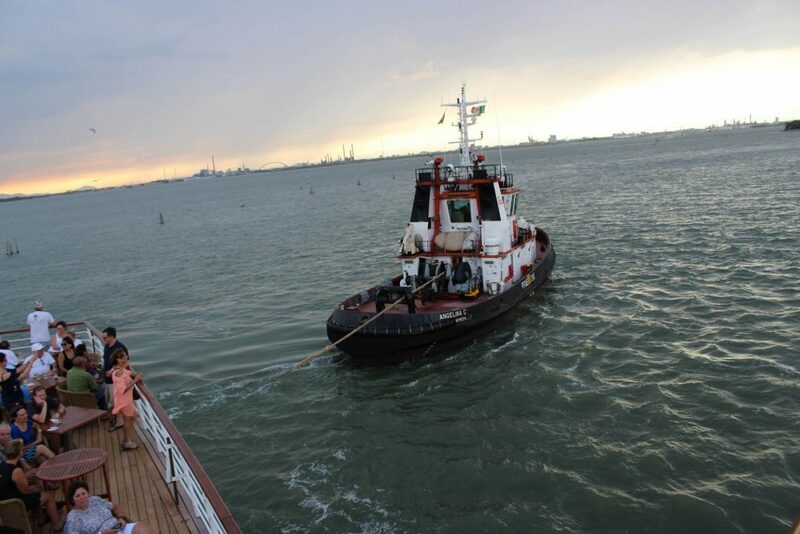 The big Venice tugboats towed and turned us around then towed us out of the harbor. 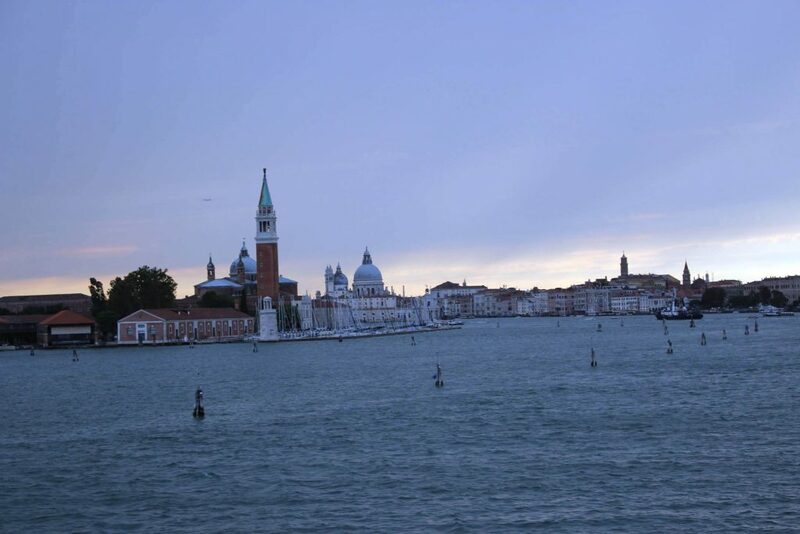 We blasted a loud farewell to Venice and sailed away. It was cool. We were in the upper deck bar area as were nearly everyone onboard. We went to the dining room for dinner and it was pretty good. We had opted for the “wine package”. 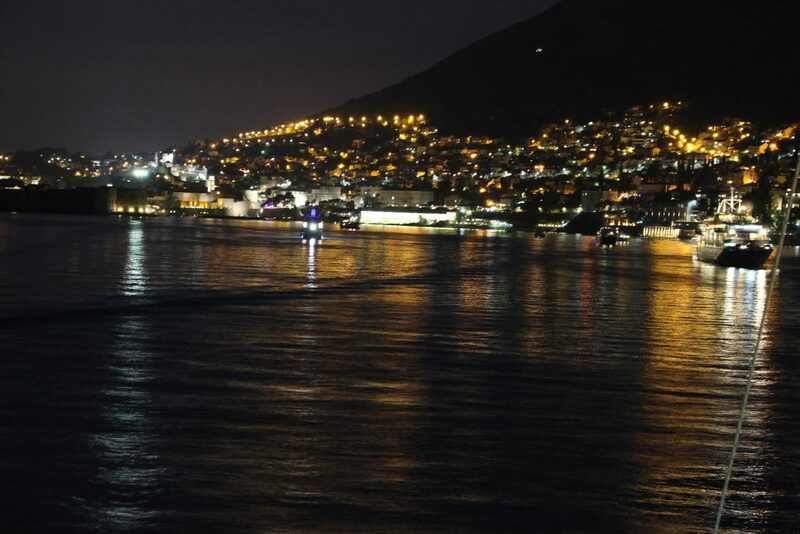 It gives you the choice of any wine on the list and unlimited consumption anywhere on the ship to include your room. I figured if anyone could get their money’s worth it would be us! But I noticed you ordered with dinner and then it was slow in coming. I wanted to set expectations with the wine steward so pretty much told him, when I order wine I expect it to arrive promptly. After that he was much more attentive. I had a corn poblano soup, can’t get that in Italia! And the grilled salmon with veggies. Luther had a minestrone soup and the rib eye steak. Hadn’t seen that cut since the US. He pronounced it good. 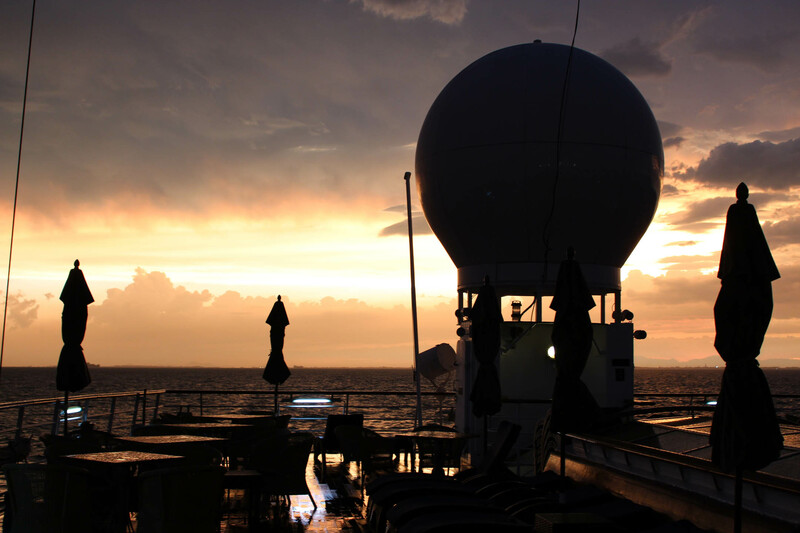 Then we went to the deck lounge where we enjoyed a spectacular sunset. The storms had wetted all the deck and furniture but there is a small under cover area. Turns out cigars are welcome so Luther enjoyed one and we had some wine and met another couple from the Bay Area who we chatted with. The four of us were the only people up there. 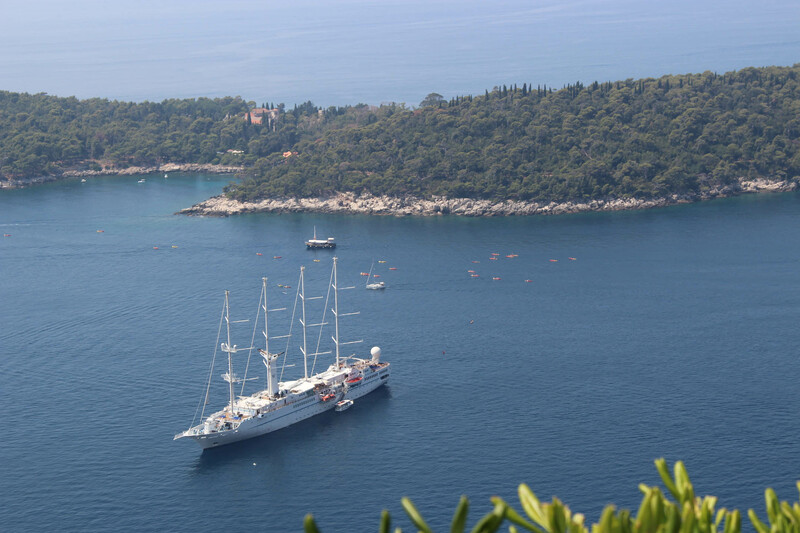 Windstar sailed all night. Overnight she navigated high seas and I could feel her rocking but it was rather like being rocked in my sleep. The sound of the waves as we move along is also lulling. Our tugboat towing us out of the harbor. Saying bye to Venezia until our return. 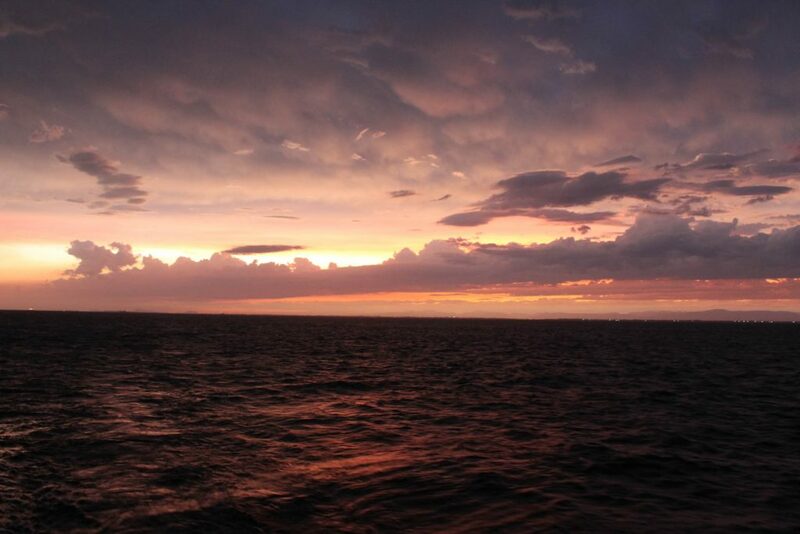 Beautiful sunset after the storms. The next morning we had breakfast and then moored outside of Opatija at noon. 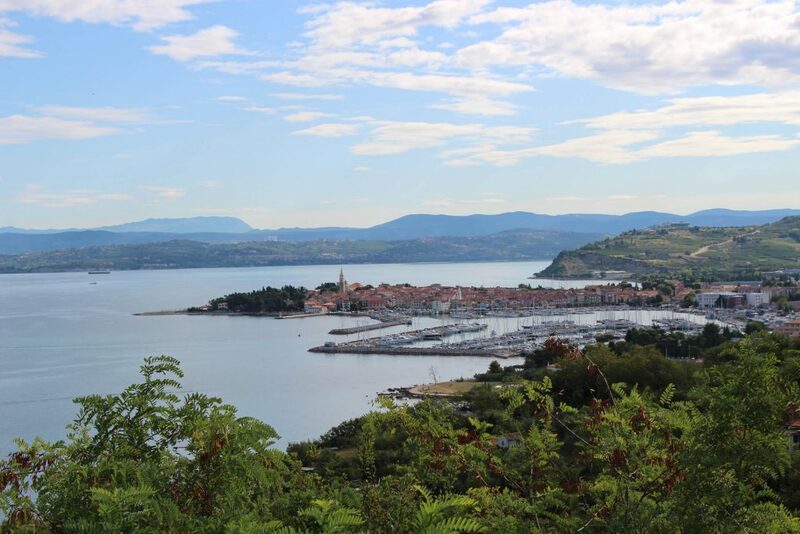 It is the oldest seaside resort on the Dalmatian coast with a 7.5 mile long promenade. We did not have a tour booked. We had a pretty exciting transfer into Opatija. The seas were very rough so the tenders transferring us to shore were bucking up and down wildly. There were two men at the entrance into the boat who watched the oncoming waves and signaled each of us to dash aboard. All got safely on and then we road a bronco across the water to the dock. Pretty exciting. We went out of the port and just on the edge was a restaurant with a nice outdoor space called Casa Tua. We decided to go and have lunch there. Most other passengers partook of lunch onboard but we wanted to check out the local cuisine. 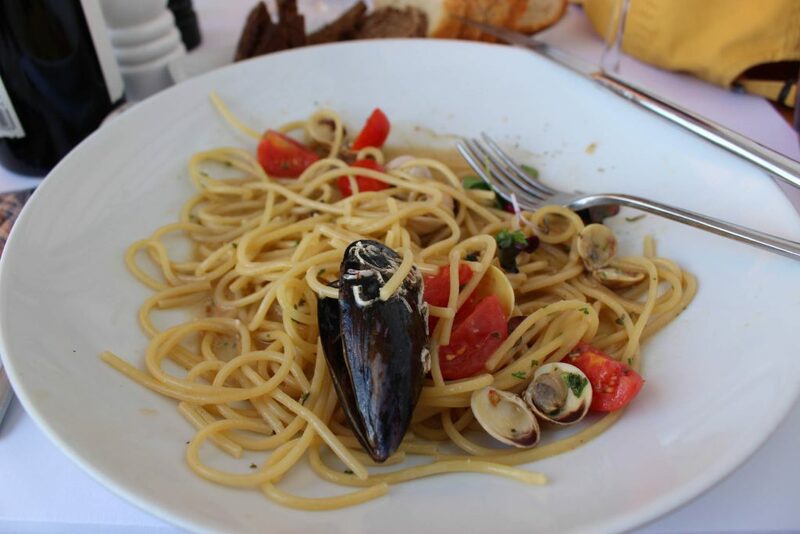 I had a very tasty spaghetti fruiti di mare. Sweet clams, mussels, shrimp. Luther had calamari stuffed with prosciutto and mozzarella. Nice Croatian Sauvignon Blanc and a Pinot noir. Really good. 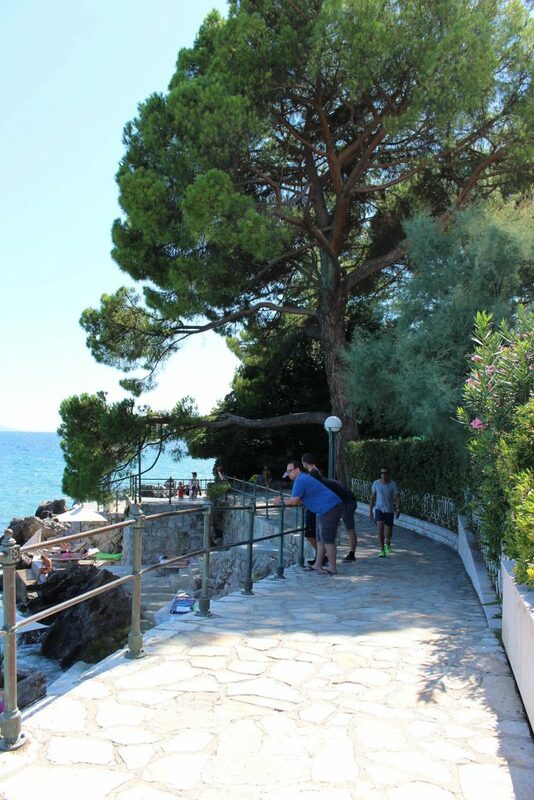 Then we walked through the beautiful park along a piece of the 7.5 mile long promenade along the shore. Beautiful villas along the way. Remnants of the Hapsburg empire. Pretty flowers and palms. Many folks on the rocky, narrow beaches. Water was a brilliant aqua marine, deep blue. We strolled into town next then headed back to the boat. Took the tender back. Not quite as choppy this time. Showered and resting before the captains reception this evening. Interestingly, we have a woman captain, Belinda Bennett. Well, the reception was a hoot. Captain Belinda could be a comedian. Great sense of timing. She’s a large dark skinned woman from St. Helena island in the south Atlantic. All the serving staff is from the Philippines. 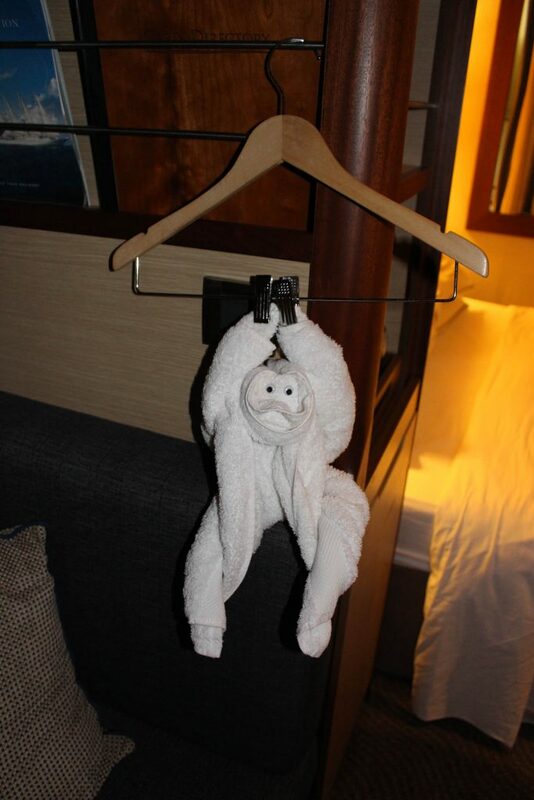 The housekeeping staff is Indonesian. And the executive staff is from all over, France, Poland, US, Ukraine, Canada are a few I remember. We went up on the top deck for sailaway. We met some people from Houston, Shiva, Gus, Maggie and Bill up there. 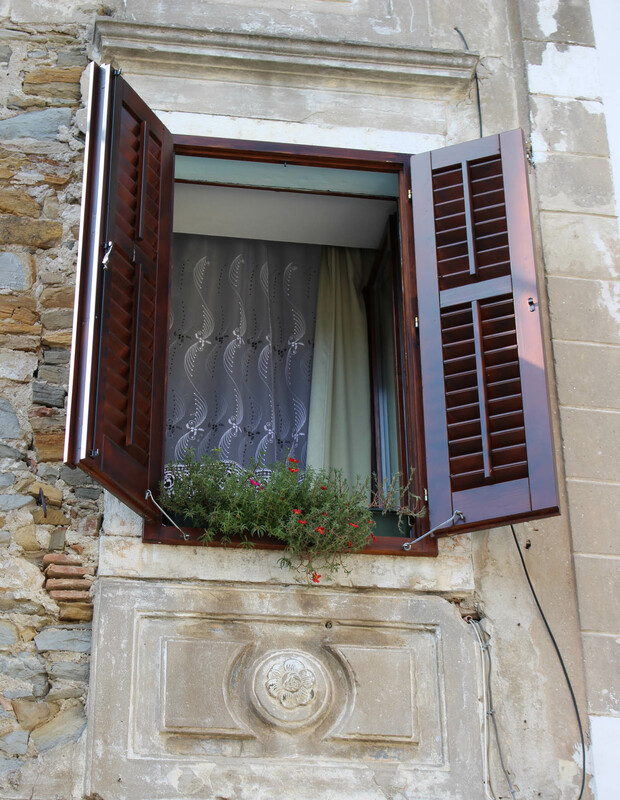 They know a town called Passignano in Umbria nearby us and were excited to hear we live near there. Dinner was all Indian for me, lamb harissa soup and a lamb Biryani dish. Luther had carpaccio and cod on a bed of rice and veggies. All good. We headed back up top so Luther could have his cigar. Croatian language needs to borrow some vowels. Part of the 7.5 mile long promenade. 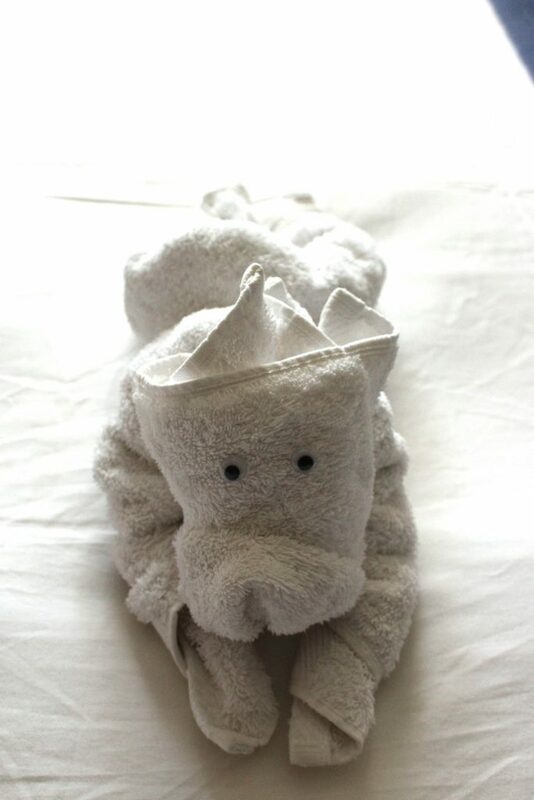 Our first towel friend! Every night, during turn-down, the crew makes a cute little animal out of towels. They also leave a daily program for the following day with info on the destination, activities and shore excursions. 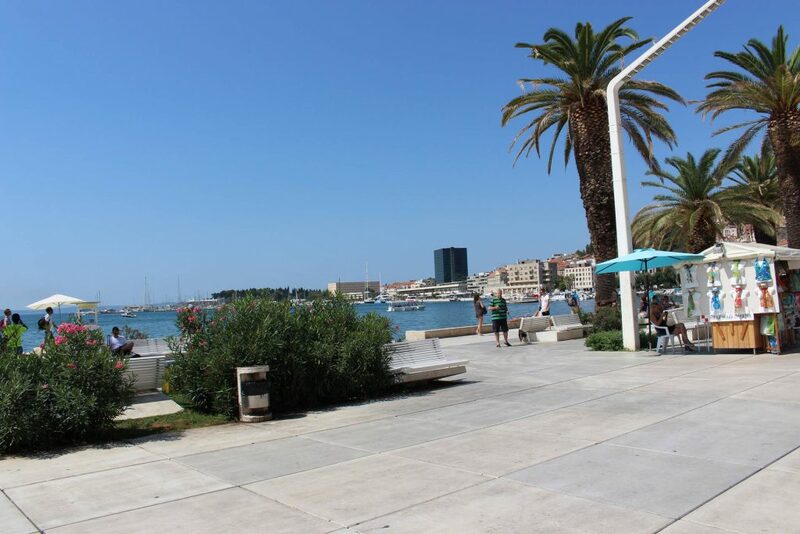 This day we docked at 9 am in Zadar which is an interesting town for walking around. It was quite nice if gawdawful hot. We walked the old town. Did a bit of shopping. Visited the Museum of Illusions and the Glass Museum. We visited several churches and cathedrals and the Roman forum which was extensive. 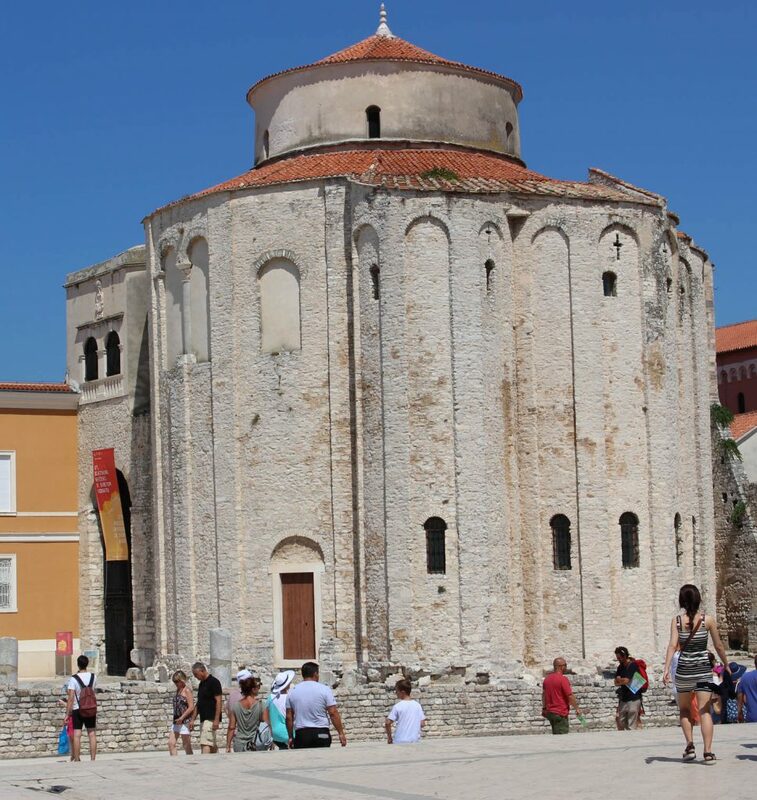 Croatia is Roman Catholic. We had a beer and headed to the ship for lunch. Along the quay there is the Sea Harmonica. Very cool instrument with holes in the stone of the seaside promenade where the waves go in and out and make ethereal music. Lunch was light. They have buffets and a la Carte. I opted for the Greek salad. Luther got the tuna salad. We rested and joined everyone outside for the sailaway. Still did not unfurl the sails at that time but later they were out…not all the way but three out of four. We had arranged dinner at Candles. A special venue set up on the deck with an outside kitchen. Mostly grilled. Very good. I had beet and goat cheese salad. Not enough goat cheese, just a schmear on the plate. Then filet mignon. Nice American beef. Luther had the shrimp cocktail and veal chop. The regular restaurant is a blast from the past with old fashioned items like beef Wellington and duck a l’orange (!) Thankfully they have other things as well. The dinner at Candles was very nice. We stayed out on deck in the strong wind after dinner. Still not too cool. Just right. Church built on the Roman forum ruins. A pretty little interior harbor. The market was blessedly shady but still everyone was sweltering in the heat. 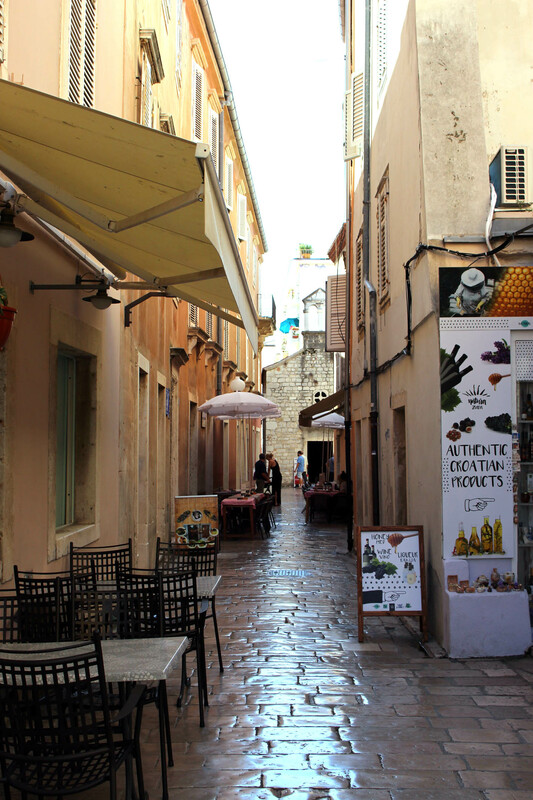 One of the streets in Zadar. It had not rained. 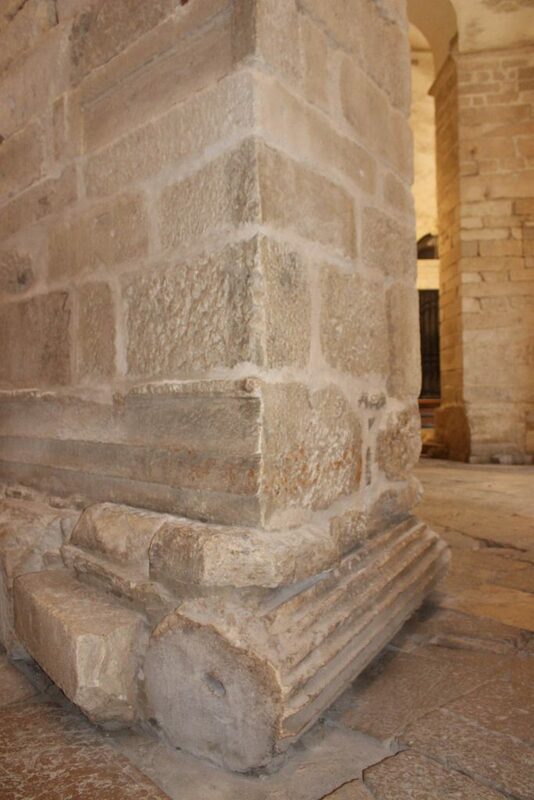 This is how shiny the stones are from years of feet polishing them. 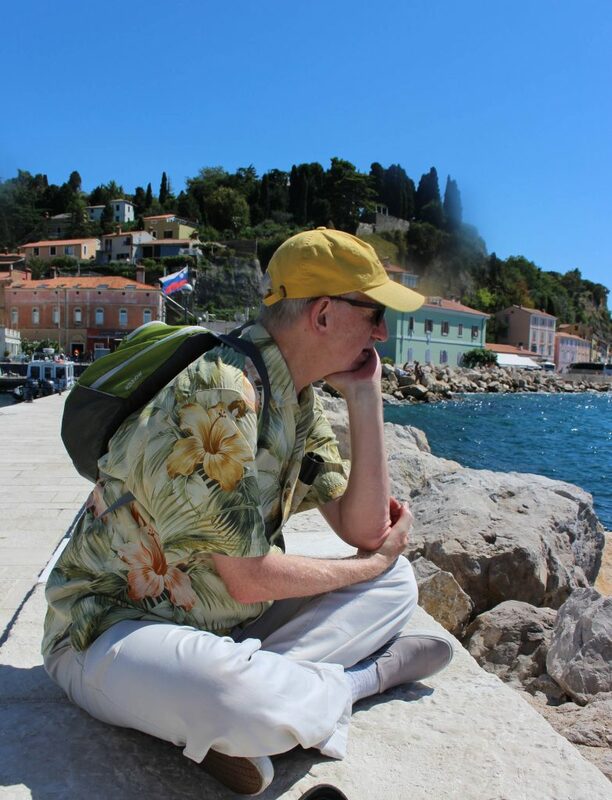 We were off to visit Split this day. Hot hot hot. And very, very crowded. 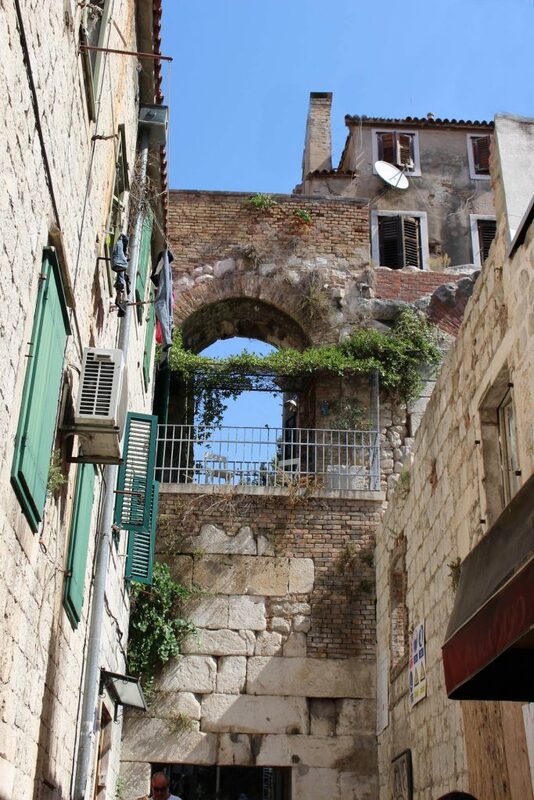 An old town that is ancient, pre-Roman. The ship docked at the main pier where the Ferries arrive from all the islands around here as well as the overnight ones from Ancona, Italy. We headed into the incredibly crowded old city. We skipped the cathedral, too crowded. We just wandered the streets and then the promenade along the sea. Stopped for a beer. Then headed back to the ship for lunch. There have been plenty of places to eat the last two days but just too many tourists. The sailaway was early, at 5pm. Then later we went to dinner. There were no two-tops left so we shared a table for six and enjoyed talking to the two couples. One was from Tampa, the other Atlanta. Later we sat on the deck and watched the sea pass by. Beautiful evening. Finally it had cooled off. Part of the church repurposed from the Roman temple. Beer to cool off. 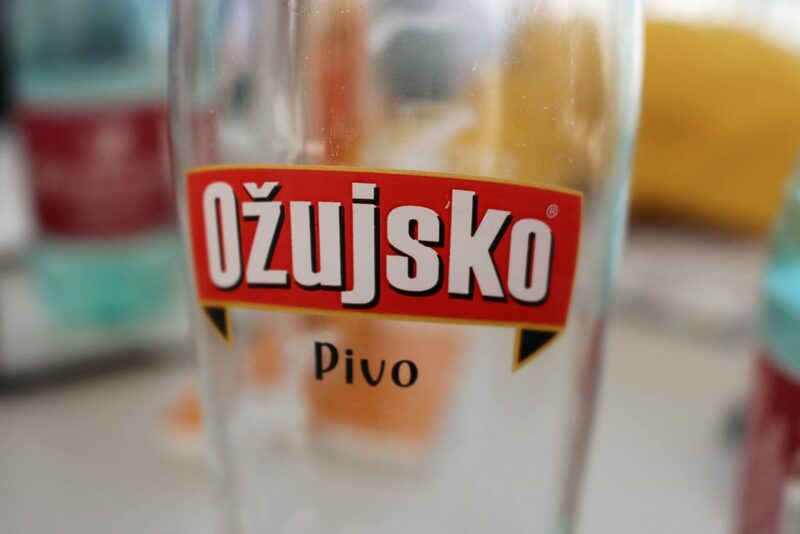 Pivo means beer. 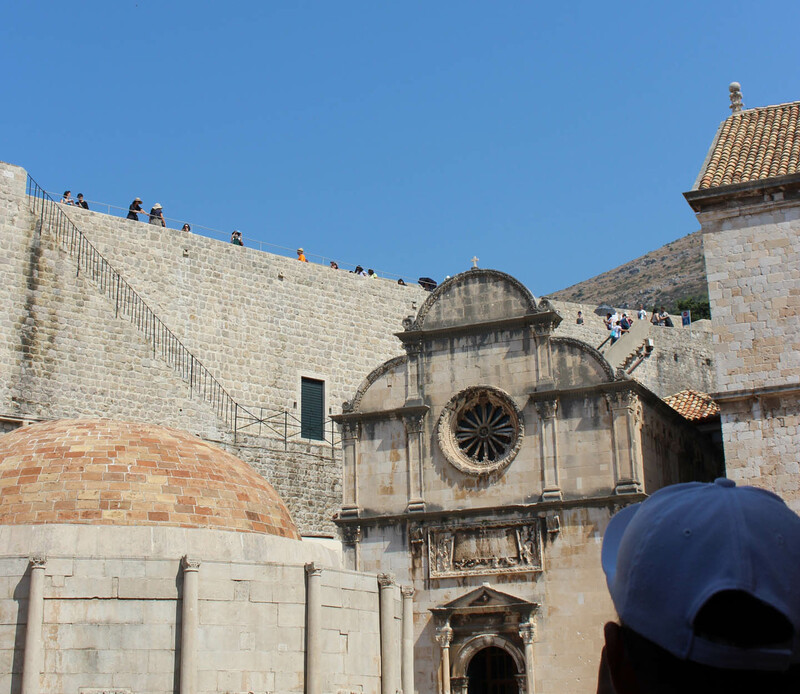 We arrived in Dubrovnik at 9am. The Pilot boarded our ship and guided it to anchor. 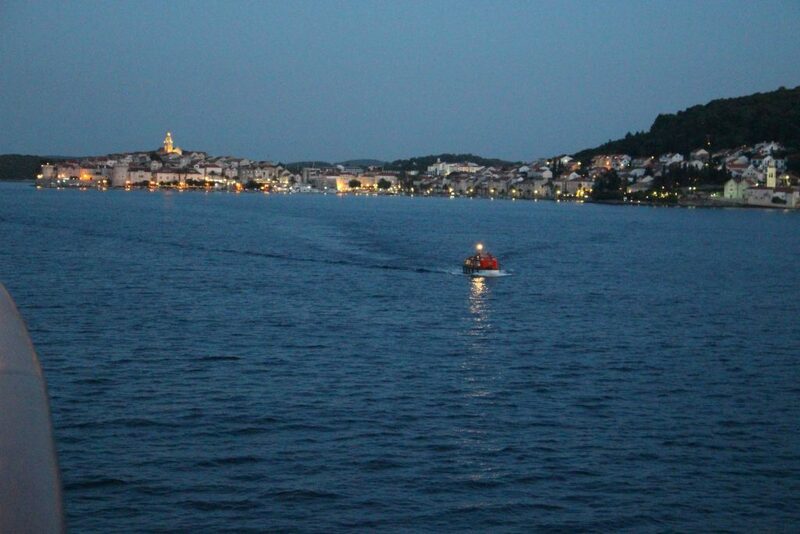 We can see the old town walls from the ship. We had scheduled a tour for this day. 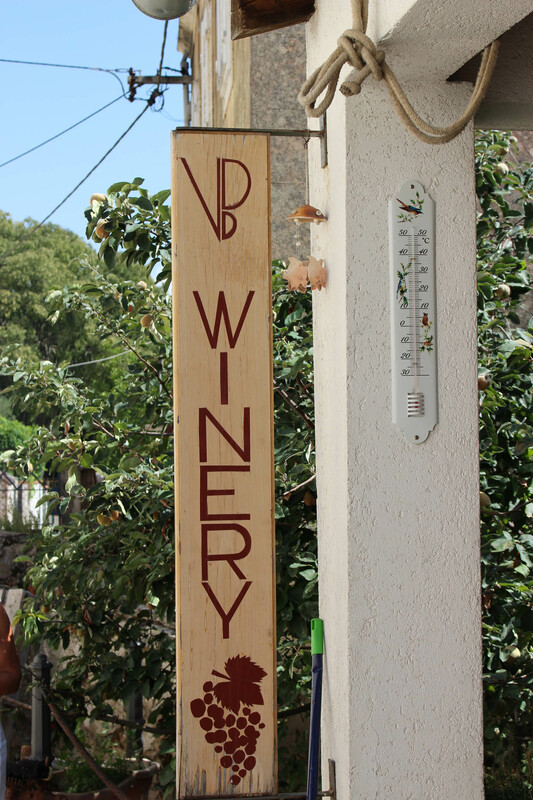 A wine tasting and city tour. I looked forward to it except for the heat. It was supposed to be 97. Just too damn hot. Later this evening was the free event for this cruise. It was to take place on a rock 665 feet above the sea. Beverages, canapés then entertainment. The city tour was interesting, crowded and hot. 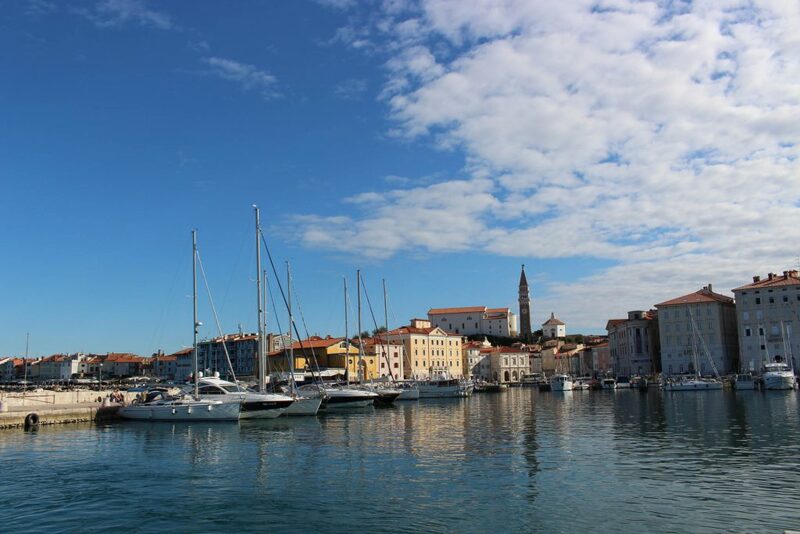 It was an overview of the history and sights of the town and country of Croatia. 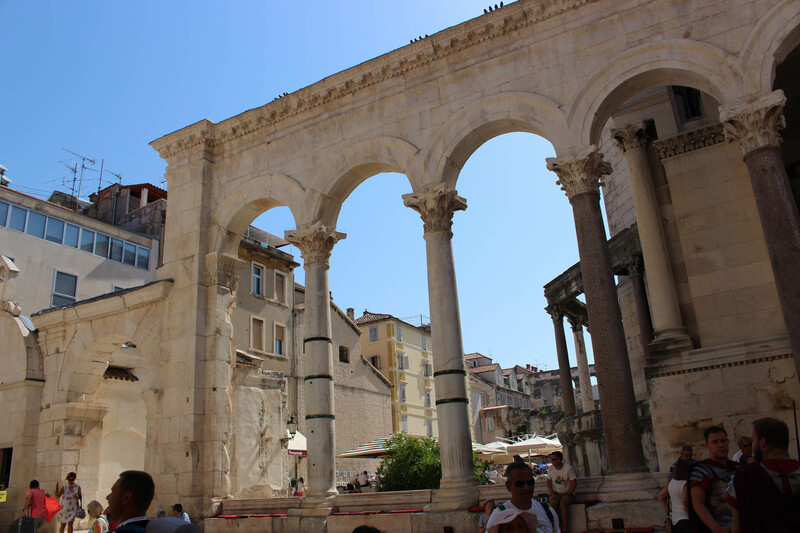 The little country of Dalmatia was independent for 500 years but later was ruled by the Venetian and later, the Hapsburg Empire. The time between the two world wars and later, under the rule of Tito were very difficult times. Croatian population voted, by 80%, in 1989 to form their own country. It did not go well. They were attacked by the big dog in the neighborhood, Serbia who were joined by Montenegro. Dubrovnik was under siege and bombardment by the Serbians and Montenegrins for over a year in 1990-91. There was much damage and loss of life. Now they are enjoying a relatively prosperous time. I hope it continues. Afterward we got a motor coach which took us to a winery. It was a pleasant drive along the coast with AC! All the buildings in the area were destroyed by the Serbians during the 1990 war. Most have been rebuilt. The winery is a family operation. They let us taste three of the wines made from the local grapes. They also make Merlot and Cabernet. We had a lovely lunch of prosciutto, local cheese, olives and wonderful home baked bread. There were 18 of us from the ship. We rode back and were dropped off. We walked to the dock and Luther and I decided to walk a bit and ended up in an air conditioned wine bar. The heat was incredible. About 100. I get soaked with sweat. No more July or August vacations for me! Returned to our room. The shower was the high point of my day. All clean and comfy. We decided to not do the event that evening. Just too hot to go back out, get in the crowded tender, board a bus, for the event which didn’t sound worth it to us. We ordered dinner in our room. You can get anything from the dinner menu, we had two soups and lamb chops. Very tasty. Out on the top deck to watch the boat action. It was still very warm. Sailaway was not until midnight so we missed it. The walls of Dubrovnik from the tender bringing us in. These are the 1.5 mile long defensive walls built from 1,100 to 1,300. People walk them. It was way too hot for me! Not to mention there are many steps. 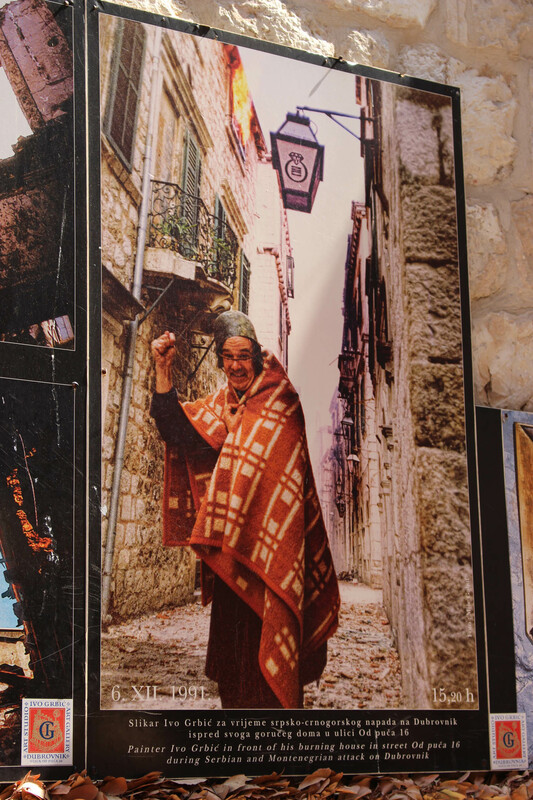 From 1990 – 1991, over a year, Dubrovnik was under siege by Serbia and Montenegro. The citizens were defiant. If you look at this photo you will see the house owner who escaped his burning house raising his fist in anger. Notice the top floor window has flames coming from it. Also take note, he is wearing a cooking pot on his head. Hah! good as a helmet I guess. It was a difficult time. One of the side streets off the main one. People live up in these streets and leave the main part of town to the tourists. 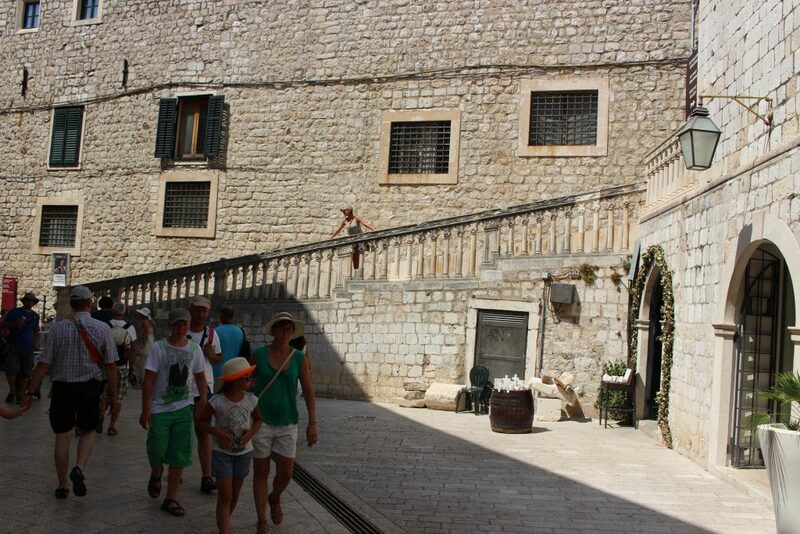 This is said to be the Walk of Shame banister from Game of Thrones which was shot in Dubrovnik. They have entire tours for this series. I have not watched the show. Windstar from up on the cliffs. 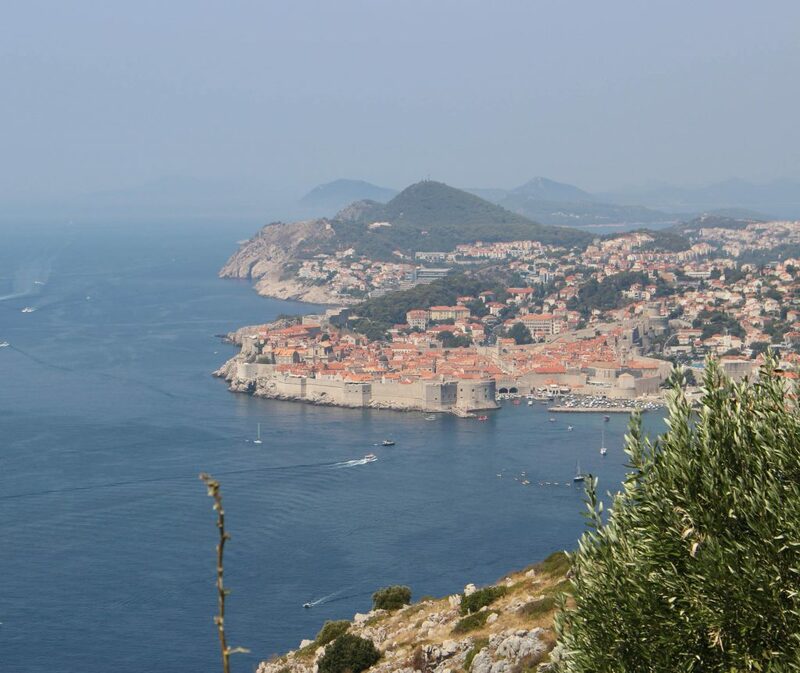 View of Dubrovnik from above. Headed back via tender to the ship. Shot of the city at night. We arrived at our next port at 8am. The last port in Croatia…Korčula. We had scheduled a tour this day. 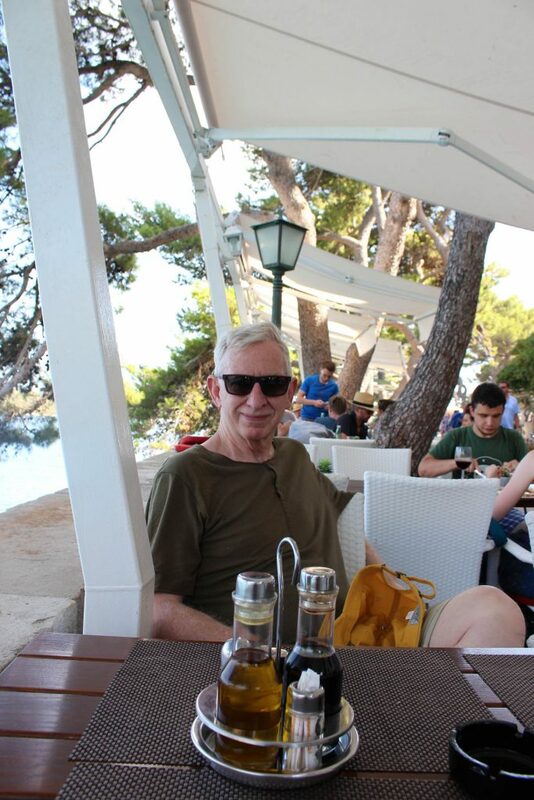 Wine and Croatian delicacies. After breakfast we met up in the lounge with the other tour goers. There were only ten because of limited space which was fine with me. We tendered into shore and met our tour guide. 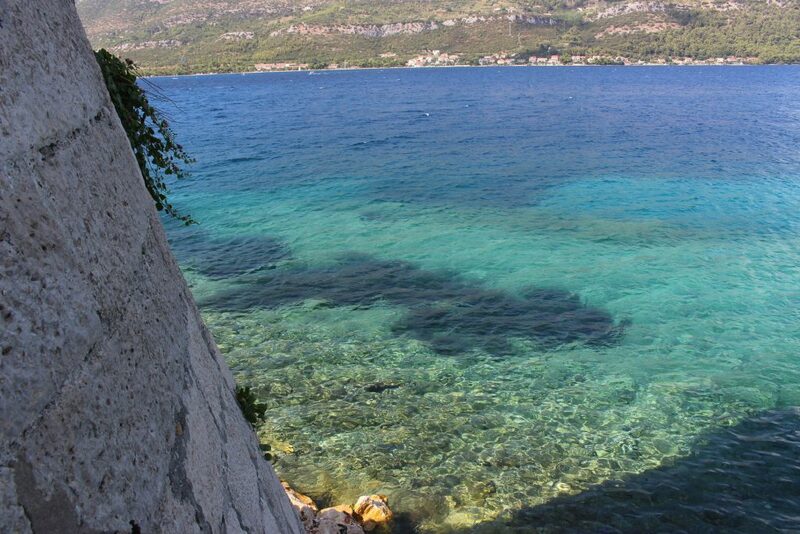 The island and town of Korčula are beautiful. The town is small and built of pretty light tan stone with rounded towers and tiny streets. We headed right over to where our boat picked us up to cross to the mainland. We traveled about 45 minutes by small bus to the first winery. We taste three wines, one white and two reds. 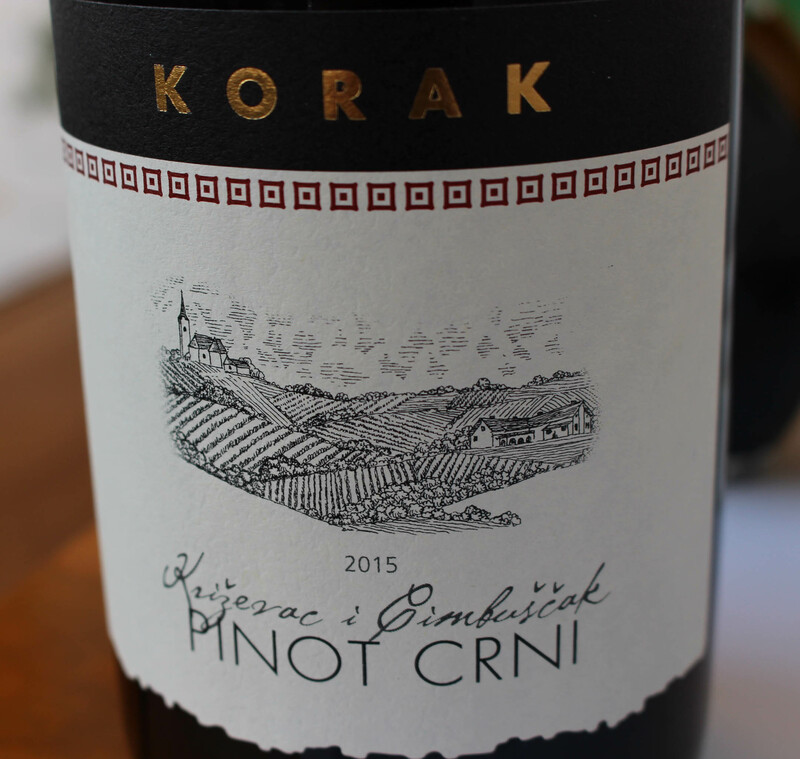 They were all grown from local grapes called Plavec. The two reds were the same grape grown in different terroir. 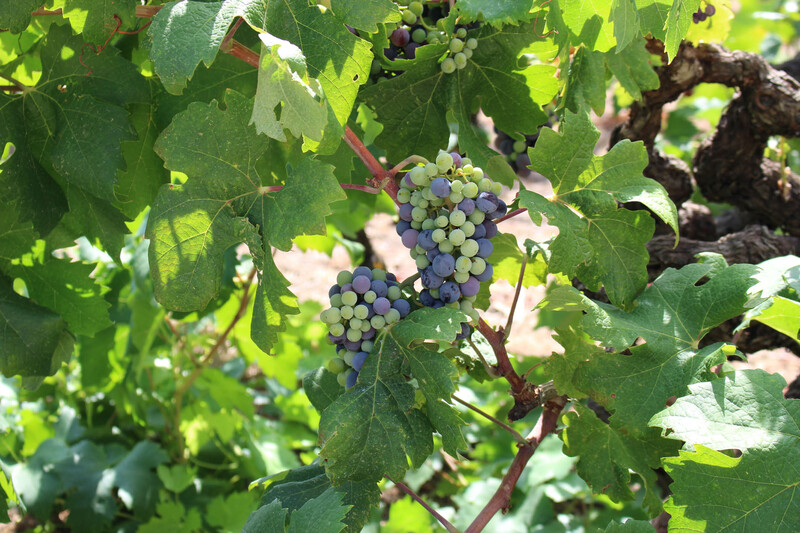 The Croatians are very proud to say Zinfandel is a genetic match for this local grape or the birthplace of Zinfandel. The Italians also claim this as well. 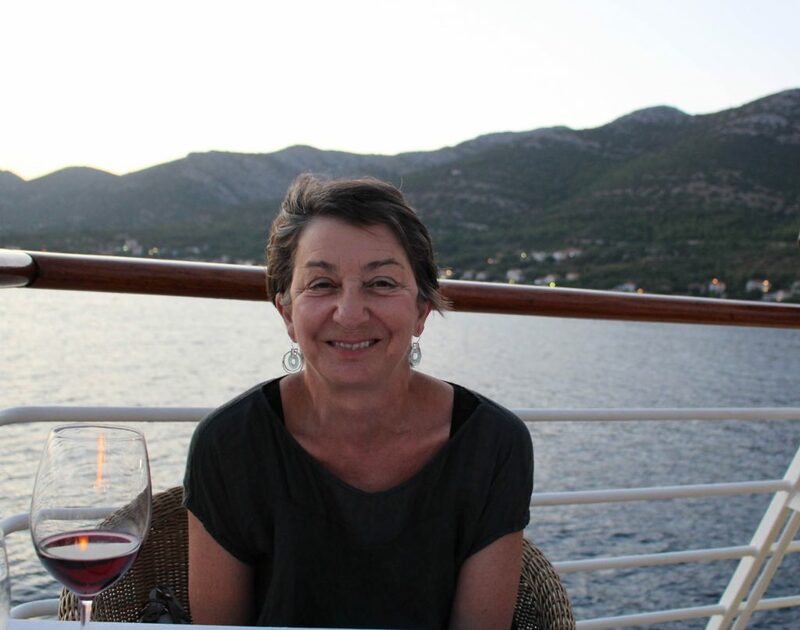 I guess the Primitivo grape of southern Italy and the Plavec in Croatia and Zinfandel could all be related. 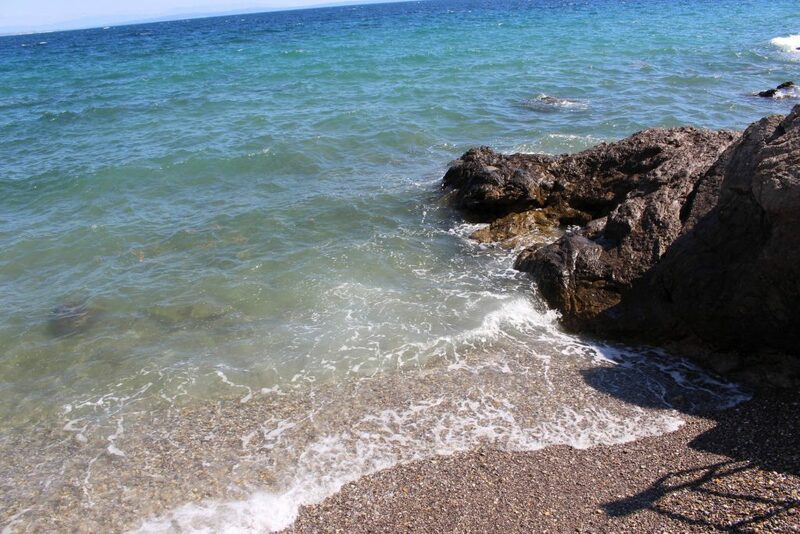 Southern Italy is not that far from Croatia. The winery had pretty gardens outside and something I’d never seen. A kiwi plant. It was like a grape vine and trained on an arbor and you could see the fruits hanging above. They also had peach trees laden with beautiful fruit. 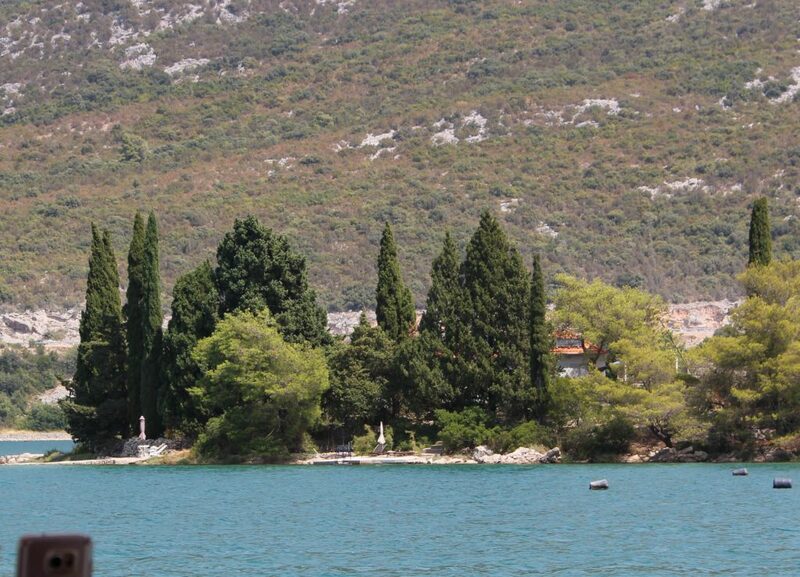 Off we went to the town of Ston. It has the second longest defensive wall in the world after the Great Wall of China. It reminded me very much of that wall as it snaked up and over the mountain. We passed Ston and boarded a pirate ship! It was cute and I’d always thought it would be fun. This boat had tables and benches. 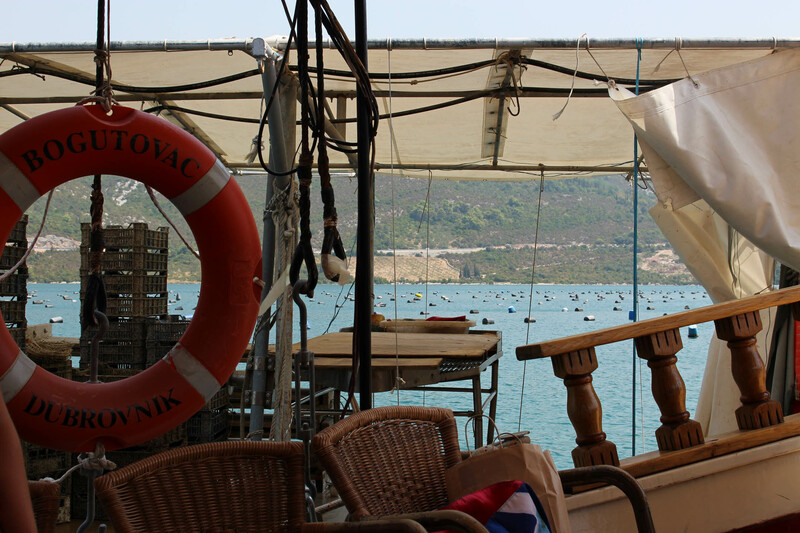 We traveled through the beautiful aqua water past hundreds of floats which were the oyster and mussel growing farms. 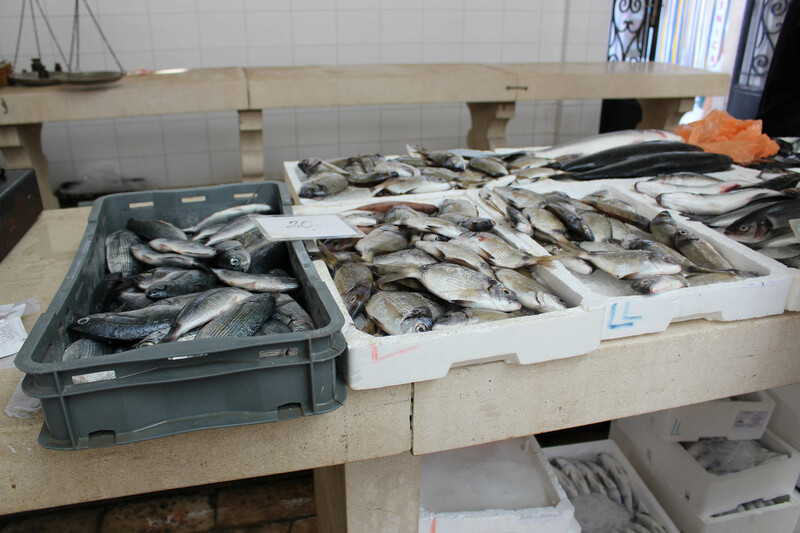 Our objective was to taste these delicacies. The boat pulled next to another boat and they proceeded to pull up ropes with different sized oysters attached to them. They shucked then and we each got three incredibly fresh oysters. In fact, they were so fresh that when you squeezed lemon on them they contracted on the shell since they were still alive and I guess the lemon juice was an irritant. We were served the fresh local wine with the oysters. 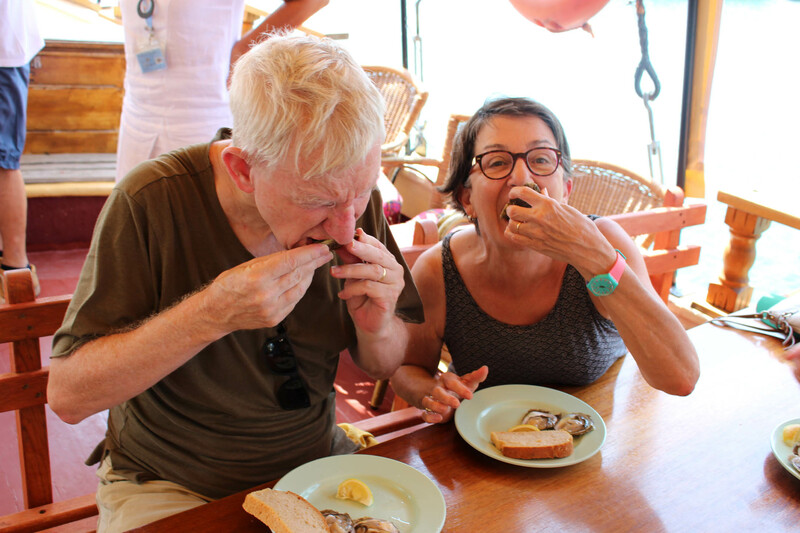 Several of the group had never eaten oysters and had a bit of trouble getting them down. Others were enthusiastic oyster lovers and we all took pictures of each other toasting with our oysters. Yum! Then they brought out bowls of just cooked mussels in an oniony broth with chewy bread. Also very good and very sweet. A one of a kind experience. Then we left for the final wine tasting. A super nice wine-maker gave us a talk and we went up into a pretty old room with heavy dark beams and long tables with benches. There were proscuitti hanging to cure and lots of oil paintings. There was a basket of homemade bread. The delicious chewy bread favored here. And a plate with fresh home grown tomatoes and three home made fresh anchovies, very briny and fresh. Fresh anchovies are a world apart from the ones you put on pizza. Not at all salty. They are cleaned and boned (apparently a tedious messy job) and the the filets are soaked in vinegar and sea salt. He said the vinegar should not be too strong so you can add a bit of water. Leave for five hours and then drain. Cover in olive oil and serve. Very good. Then a plate with cheese and prosciutto and a nice bowl of lentil soup from the lentils they raise. The wines, a white and a red were very good paired with the food. The winemakers cousin played guitar and sang folk songs which were fun. It was a nice time for us all. 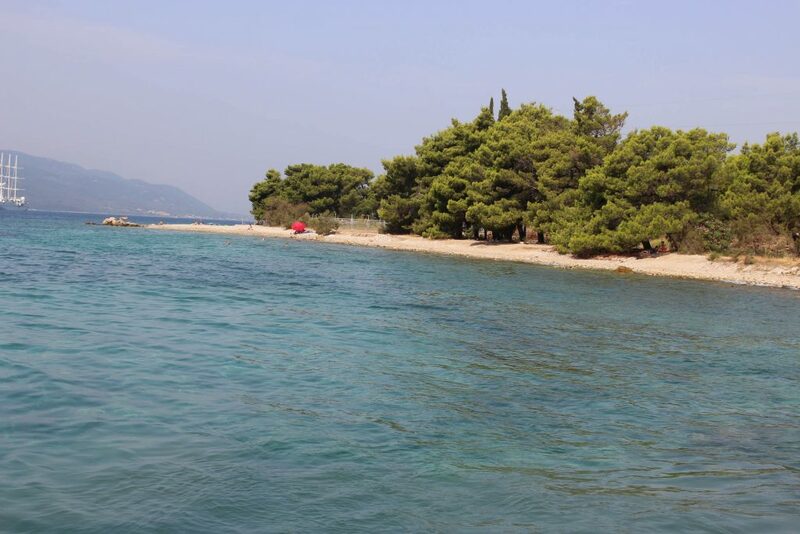 Back to Korčula in the boat and we were set free to explore the town. It is a beautiful town with a lovely cathedral. One of the interesting things we were told was that it was built on a small hill and the Main Street runs up and down in a straight line. This street is crossed by tiny streets that run up the hill from the water which is on both sides. 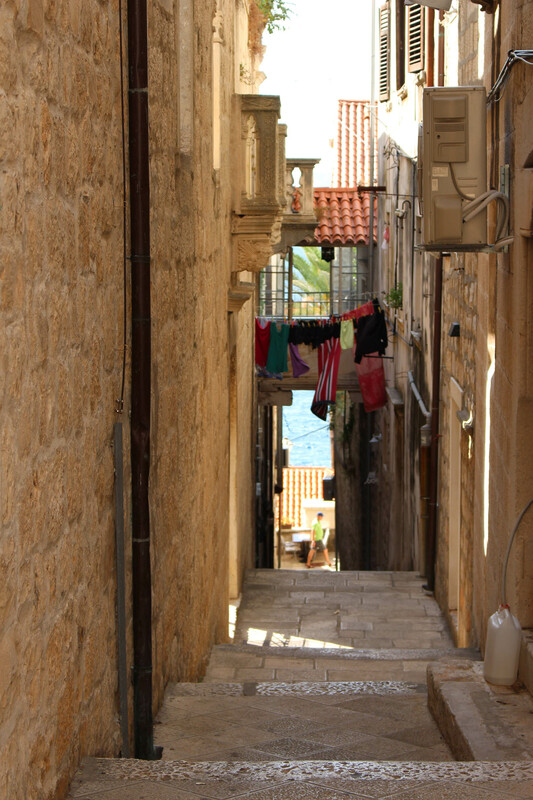 There was a strong breeze blowing through these little streets which helps cool the town. We had glasses of water and wine on the waterfront and then back to wait for the tender. The wind was very strong and riding the tender was again a bucking bronco. These are the walls of Korčula. Beach on the mainland side. 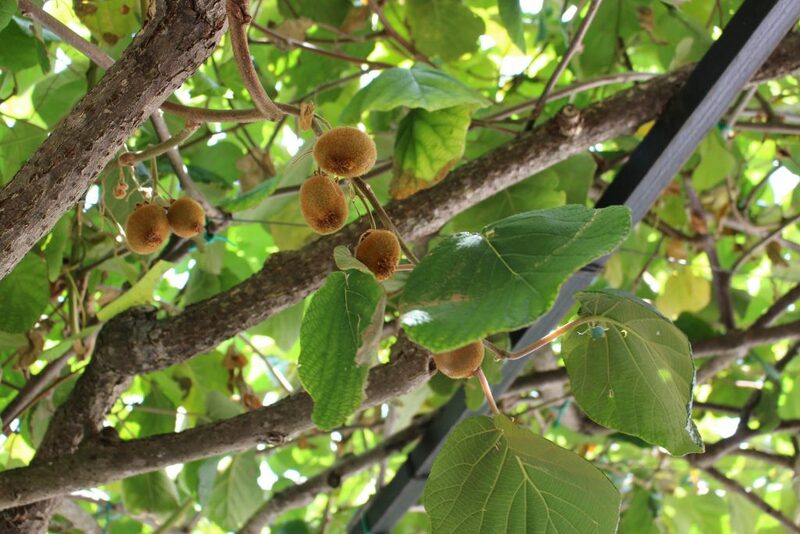 First winery had a kiwi vine. I had never seen them growing. They don’t trellis the vines. They just let them be bushes. Pretty grapes. Next stop, the oyster and mussel farm. 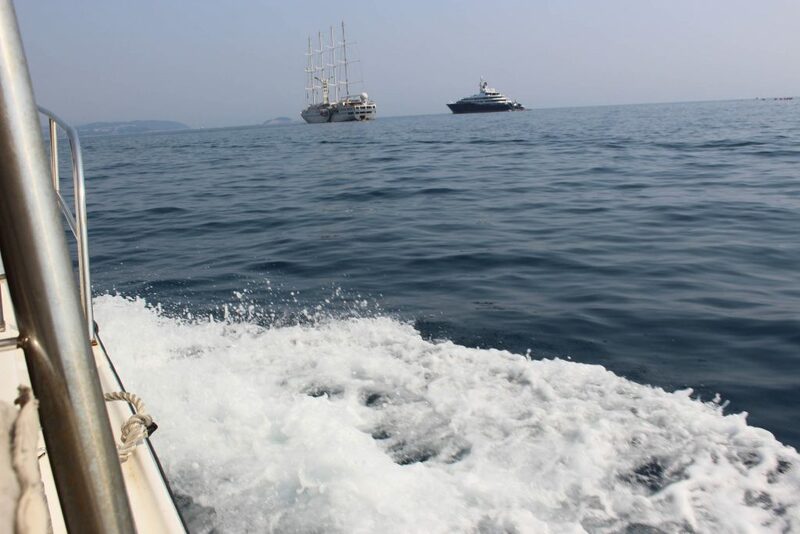 Here is our pirate boat taking us there! 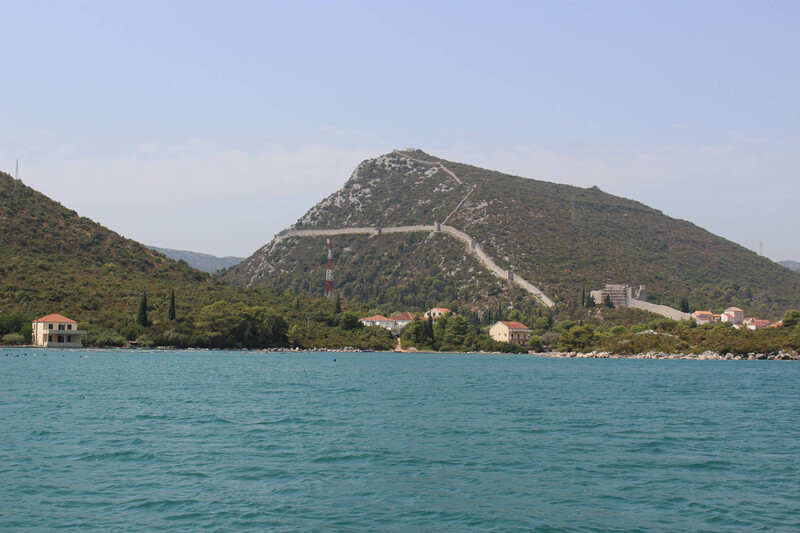 The great wall of Ston. Pretty house and beach along the way. These are the oyster/mussel farms. 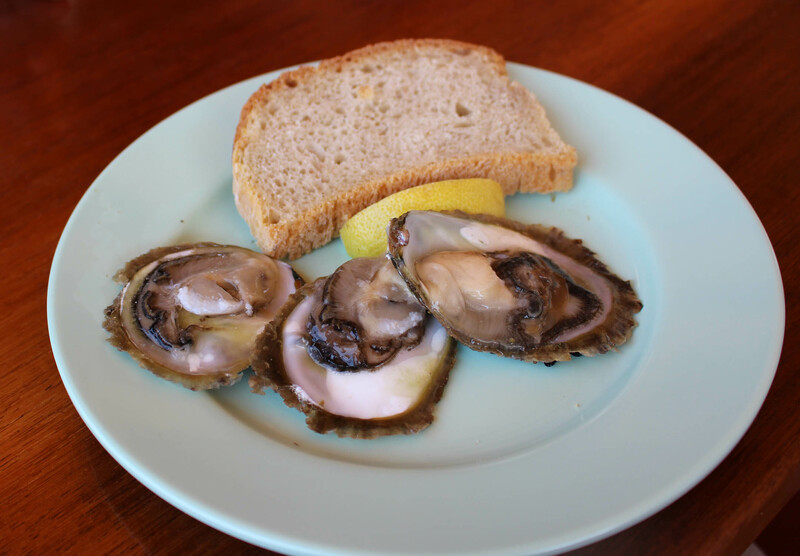 These are the oysters. It is different than in Virginia. In the flat box sitting on the rail are the small oysters which need to be protected from the fish. Once they are big enough they are cemented onto ropes and they grow to maturity. 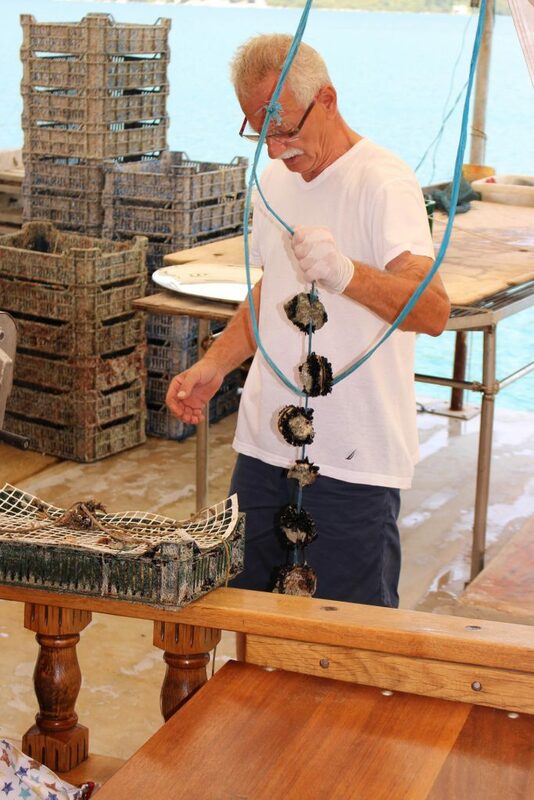 The man is holding mature oysters on the rope. We clinked oysters in a toast and slurped them down. Very good. 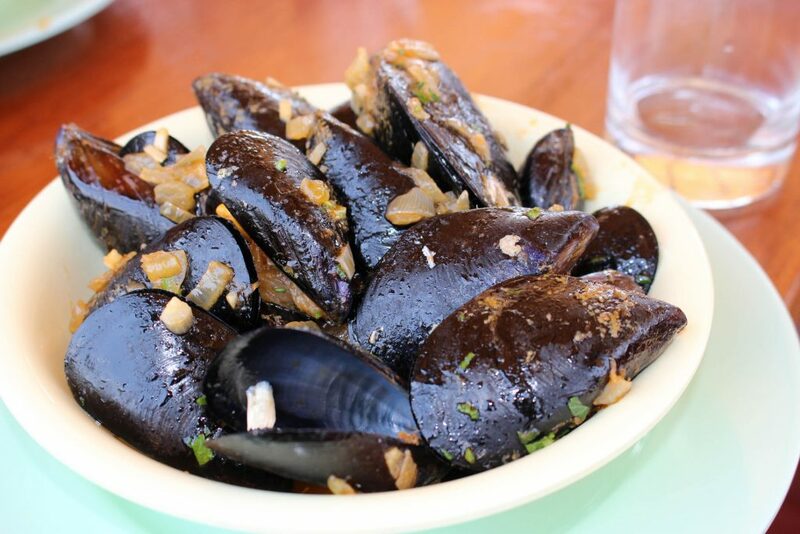 Mussels in an oniony broth. 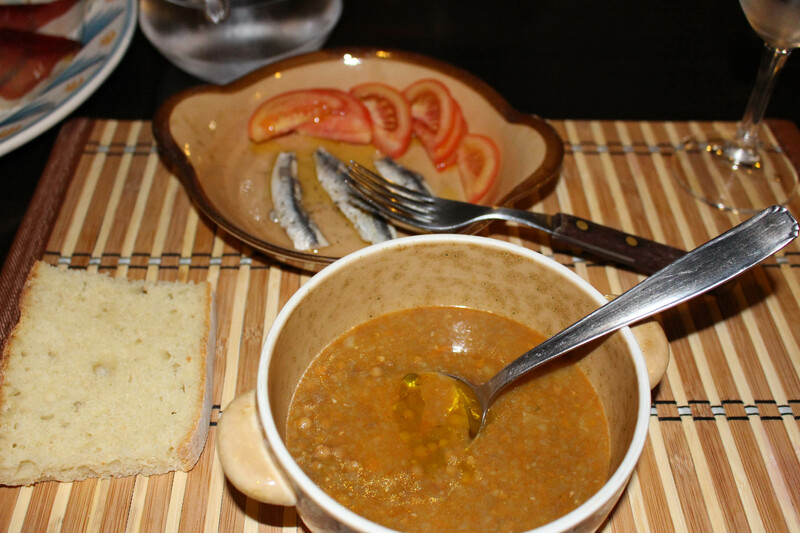 Home made pickled anchovies, fresh tomatoes, home grown and made lentil soup – This tour was truly a moveable feast!! 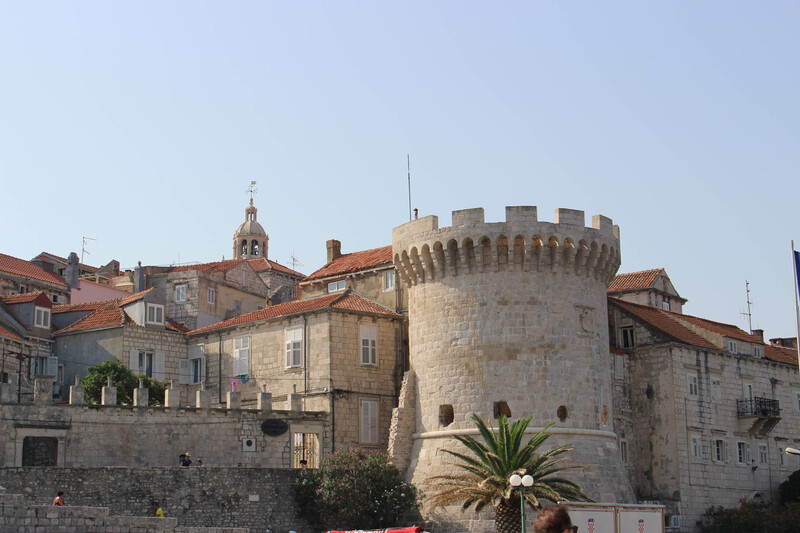 The town of Korčula is built on a small hill with streets in a grid. 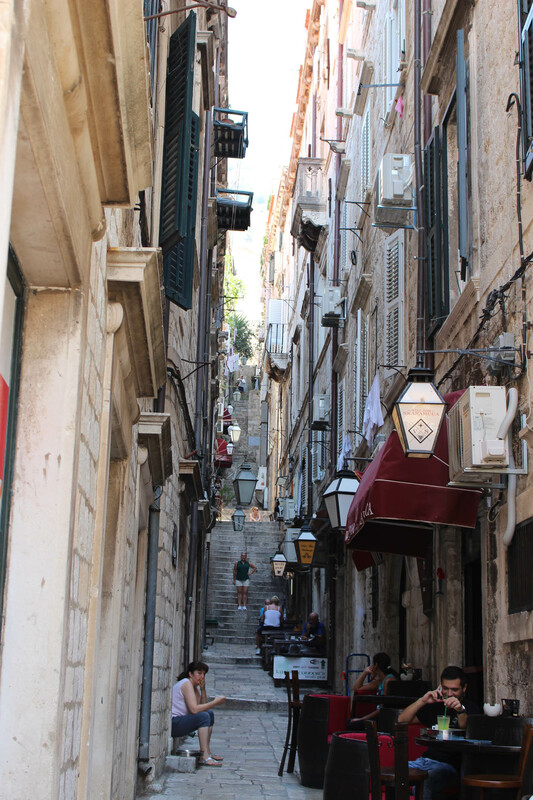 The prevailing wind blows up these small streets and is natural air conditioning. A break on the seaside. The tender ready to take us back. There was a BBQ this evening and it was something! The main dining room was closed. They had moved all the tables from the Veranda restaurant on the same deck as the aft deck and set them all with linen, china and glassware. All very festive looking. The servers and barmen all wore Hawaiian shirts. We chose a corner table with great views of the town and the surrounding water and mountains. The sun had not yet set and we had some sun and some shade. 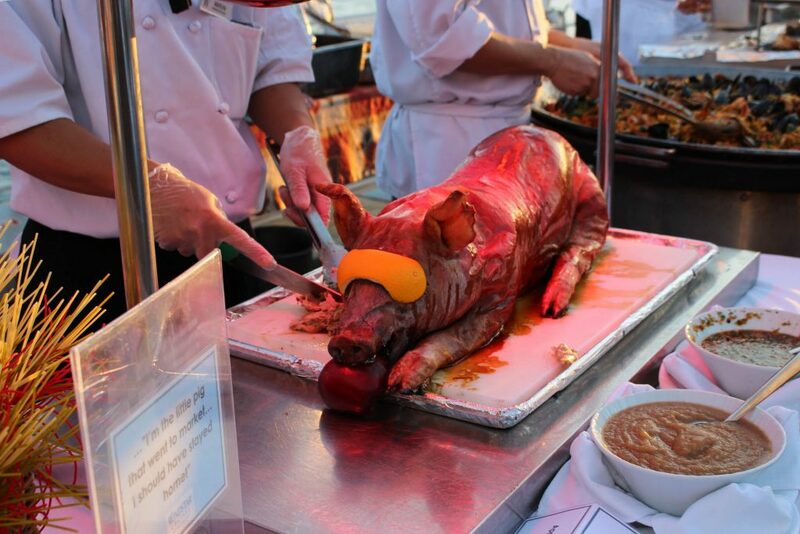 They had set up the outdoor kitchen and an enormous appetizer table. The chef with two assistants were hard at work searing sizzling flank steaks, lobster tails, and chicken. There were accompanying sauces. There was a whole suckling pig and the biggest paella pan I’ve ever seen. A sumptuous feast! I wish I had three stomachs so I could go back for more! After dinner they did last call for food so they could quickly dismantle and move all the food and grills and tables to make a dance floor. Pavlo, our tour director and all round announcer and MC got the show started. 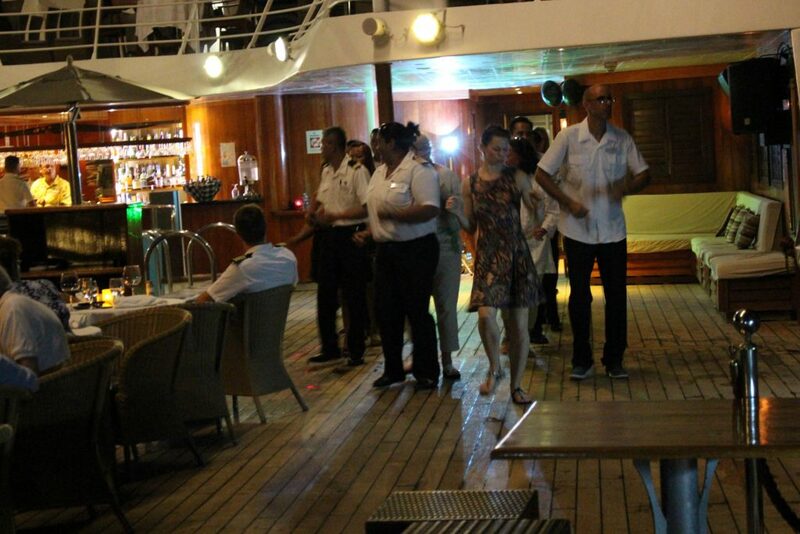 The first line dance to My Achy Breaky Heart began with mostly just crew to include our fun Captain Belinda. The crew obviously did this a lot and were great. After a few songs and a few more of the guests trying to dance they played YMCA. Pavlo was dressed in a white cat suit with sailor collar and hat! The other three crew were dressed as a motorcycle tough and a construction worker with hard hat and wife beater shirt and a fireman. We stayed and watched. I couldn’t have danced with my knee but it was fun. After the ship left anchor we headed to bed. The sea rocked us to sleep all night. We would sail all night, all the next day and all the next night to get back to Slovenia. The last tender from Korčula. 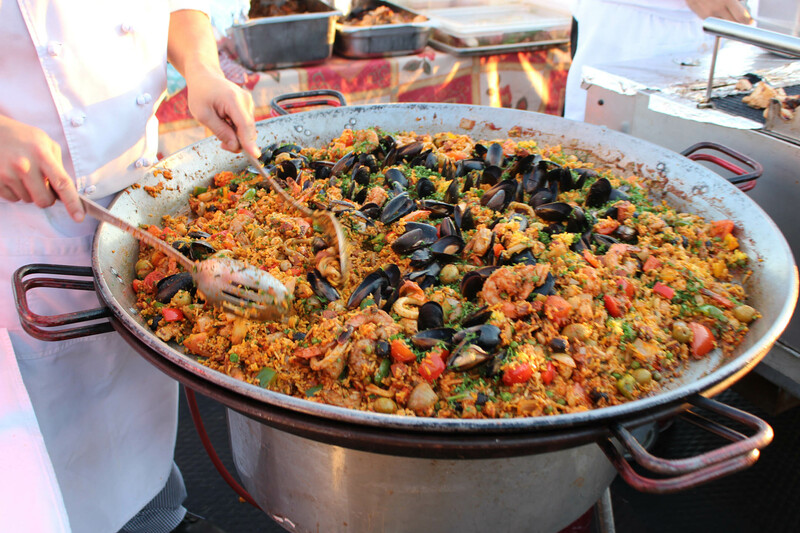 The biggest paella I’ve ever seen! 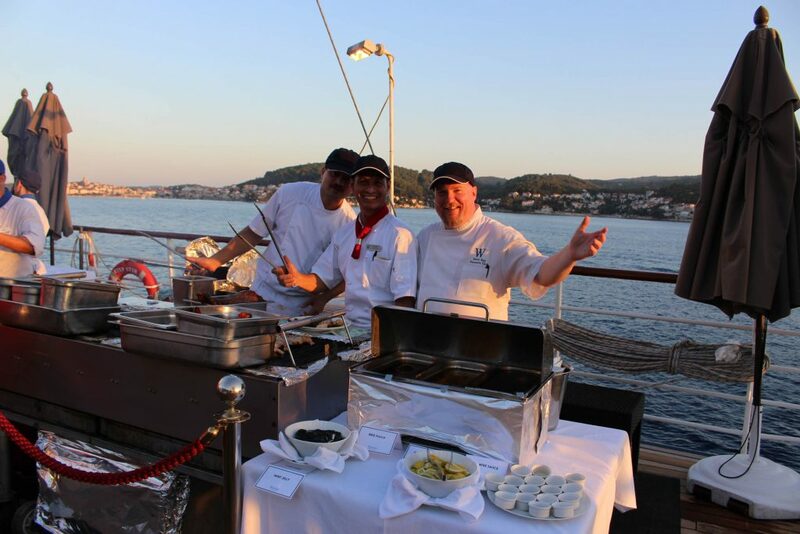 Our executive chef on the right and his crew manning the grill. Flank steak, lobster tails, chicken and ribs. Yum. Waiting to raid the food line. Afterward they cleared out the grills and food to make room for the line dancing. The crew started us out. The large woman on the left in front is Captain Belinda. Another towel friend greeted us. Saturday – Day at sea. The day dawned partly cloudy. It is very windy. We had breakfast and went on the aft deck in a corner away from the strong wind to read and relax. There were a few events planned for this day. A cooking class, a towel folding demo, trivia contest, etc. It was a day of enforced relaxation. Just what I needed! We dined with some new friends Brian and Pam from California who are interested in buying a home in Italy for maybe half year living. They are nice. Then after dinner we went to the lounge where the crew had an entertainment show for us. It was cute. 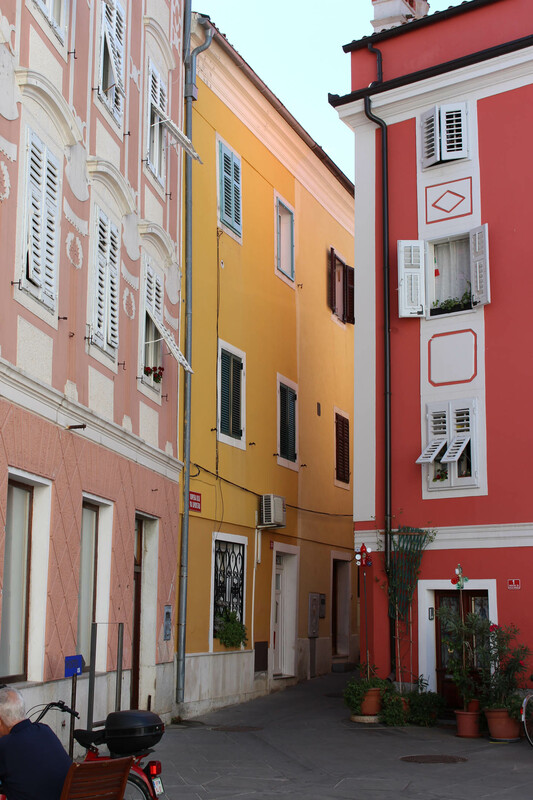 Piran Slovenia. We arrived at 8am on schedule. Our tour this day was Slovenian wine and a farmers market. We did a walking tour of Isola, a small town. It was nothing to write home about. 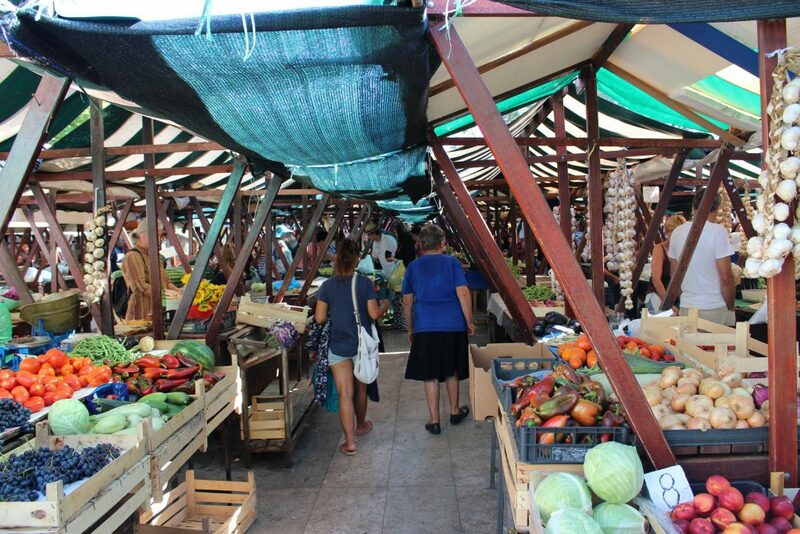 Then through the countryside and to an outdoor market. Problem was we were just 15 people and the folks who sell stuff don’t want to come out for such a small group. But we did have some. A lace lady. A lavender lady. A wine and spirits maker. Another wine guy with prosciutto bread and cheese bread. A potter. I bought some things to help the local economy. Then back to Piran where we had lunch. I had grilled sardines. 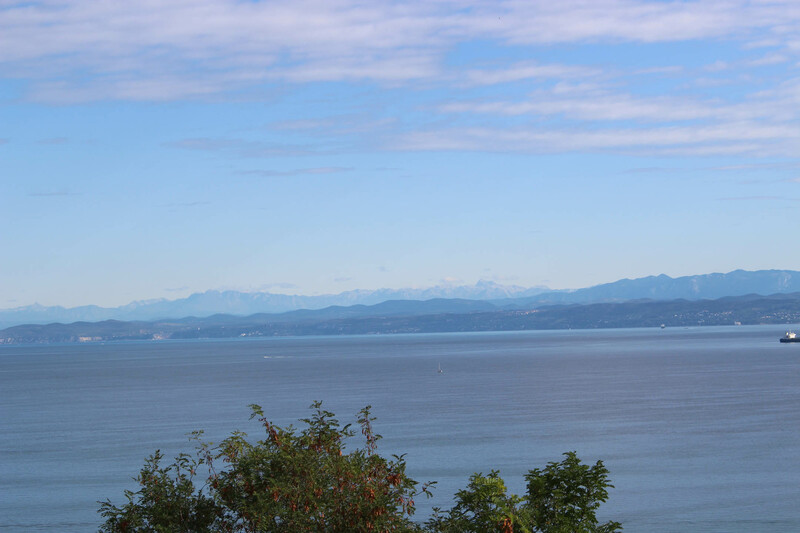 Those are the alps in the distance. The far coast is Italy, the town of Trieste. Waiting for the tender. The weather was much cooler! 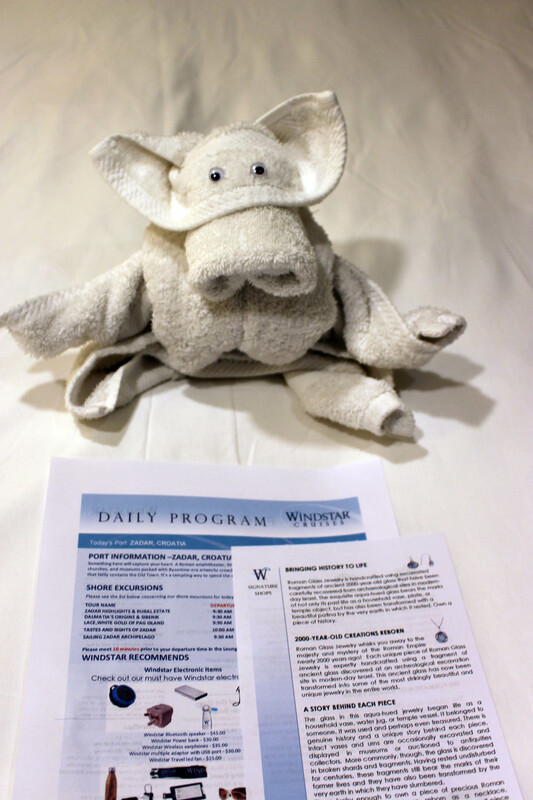 Back on Windstar we had the farewell address from Captain Belinda and all the crew and support staff came for a bow. They are a super group. They all remembered our names! 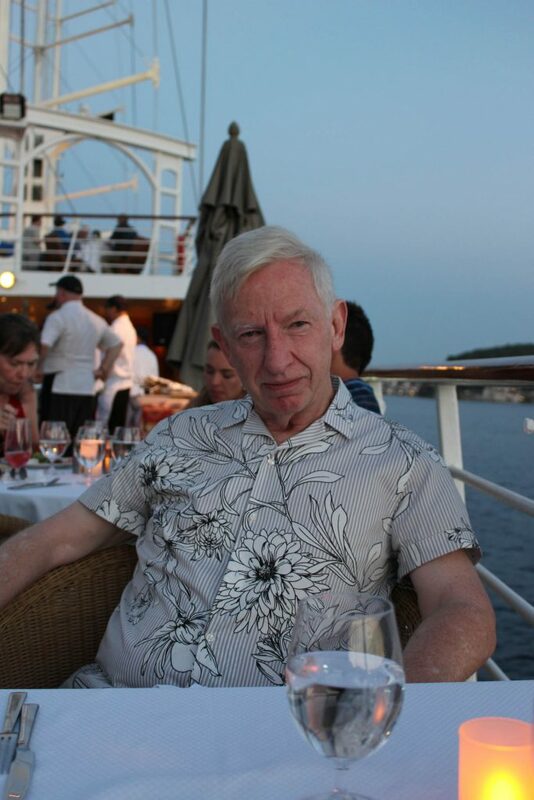 Then Pavlo, our tour director told us about upcoming cruises and about disembarking tomorrow. We had dinner and sat up on the top deck to see the sailaway. It was lovely as always and they played Time to say goodbye. Sad but true. All done. All in all we both really enjoyed this cruise. A couple of things I would change but mostly pretty great. 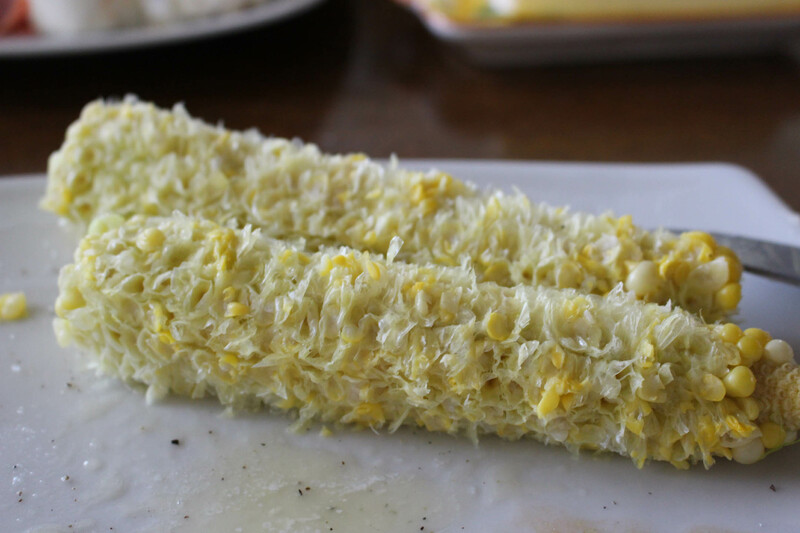 This entry was posted in Eating, Travel, Trip Report, Uncategorized on August 16, 2017 by Nancy Hampton. Oh my god…we have harvested our first corn. It was AMAZING. 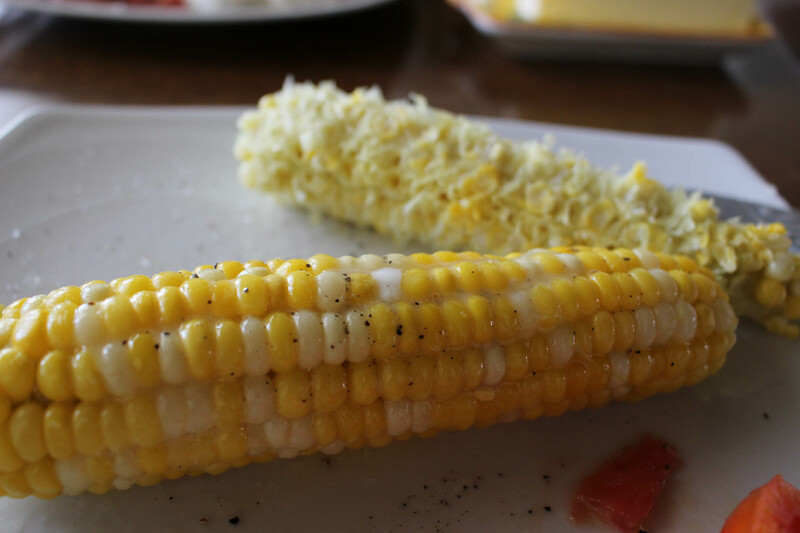 After four corn-less years it was heaven on earth. 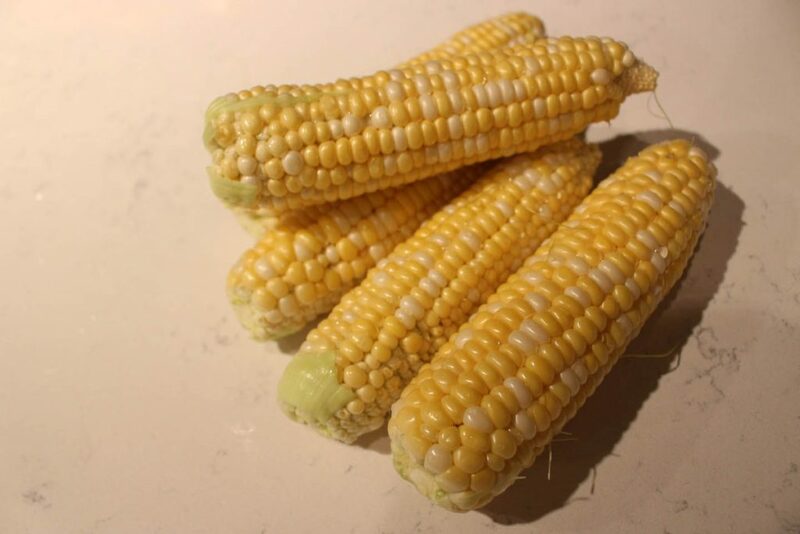 I am so happy we got some corn this year from our shared garden with Angela. 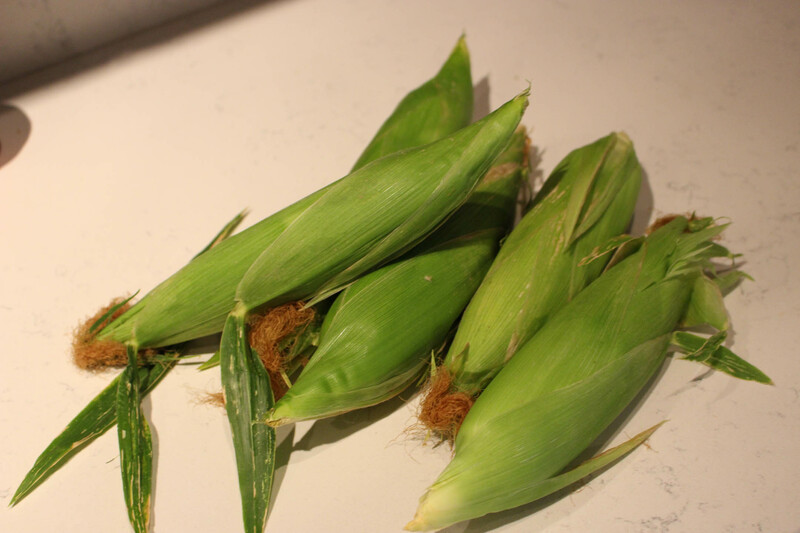 We have a guest so we went together to check the corn and I deemed it ready to harvest. We picked 5 ears for our test run. All ready for the pot. 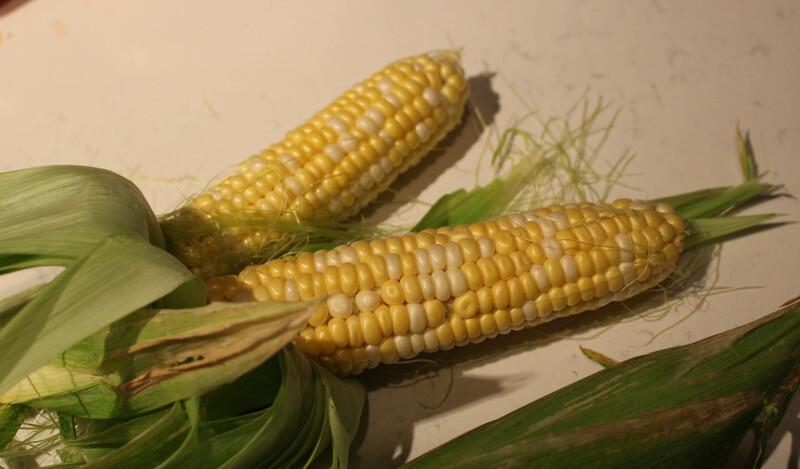 within three hours of picking will ensure a mighty sweet ear. um um good. Buttered and salted and peppered. Soooo good! 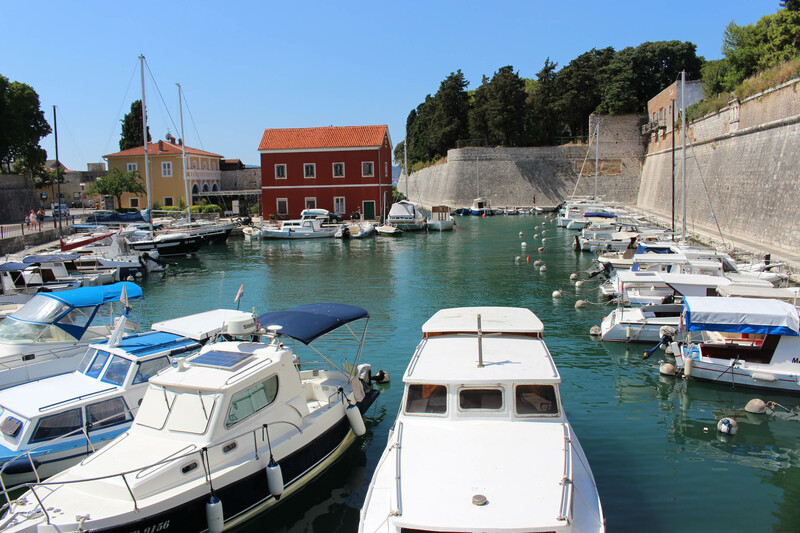 My unfortunate timing means we are gone on our Croatia cruise next week so I will not enjoy it as much as I would have liked. We will see what is left when we return. This entry was posted in cooking, Eating, everyday life in Umbria, garden, Uncategorized on August 3, 2017 by Nancy Hampton.